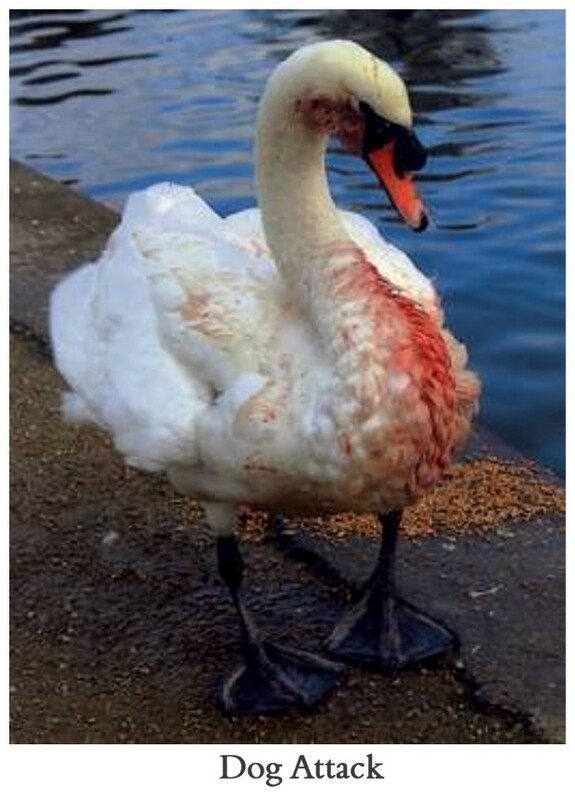 WHY YOU SHOULD NOT FEED SWANs BREAD !!!!!!!!!! 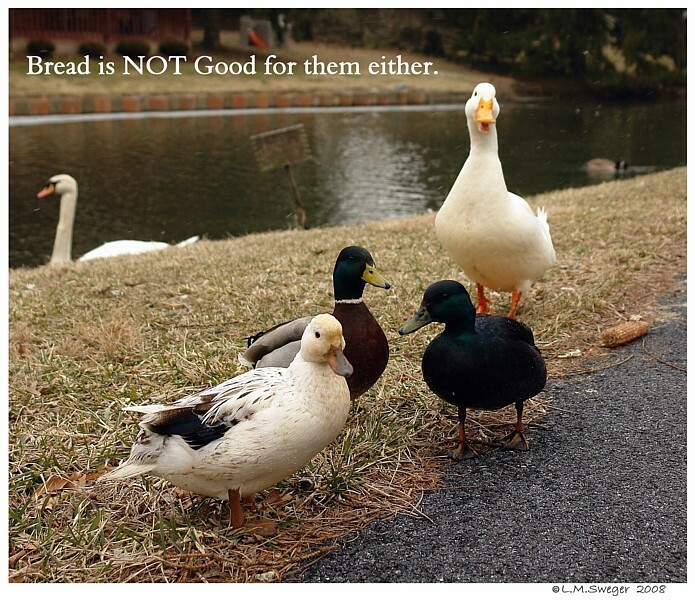 NOT TO FEED BREAD TO WATERFOWL. 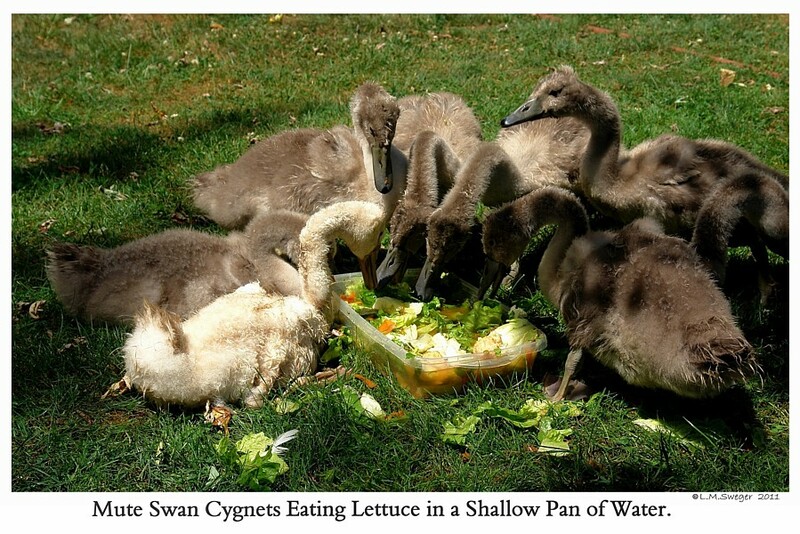 NO ONE SHOULD FEED YOUR SWANs BUT YOU !!! 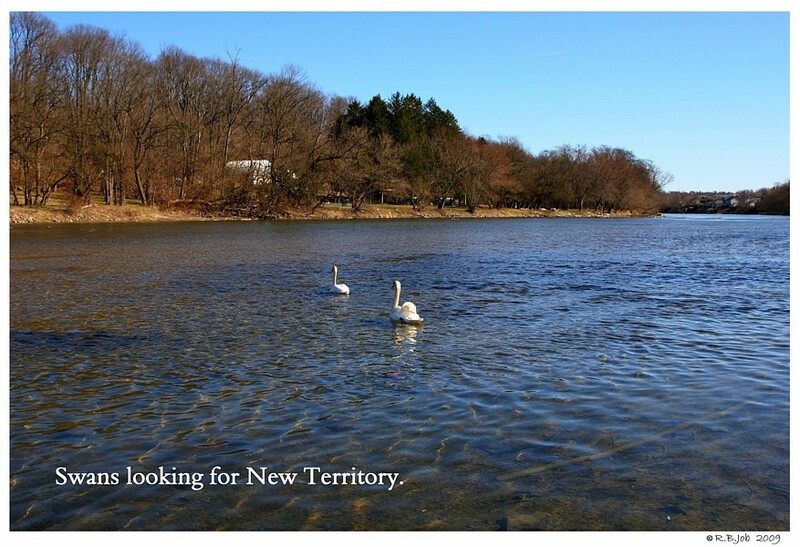 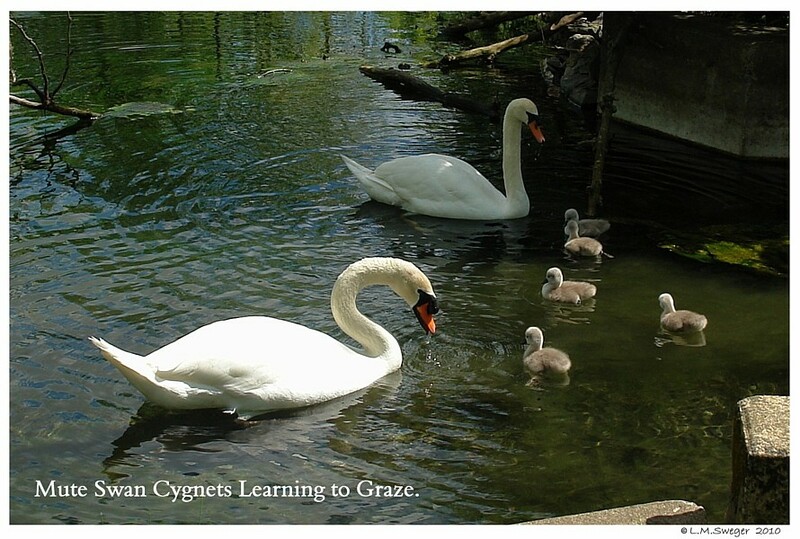 being given to your Private Captive Swans. 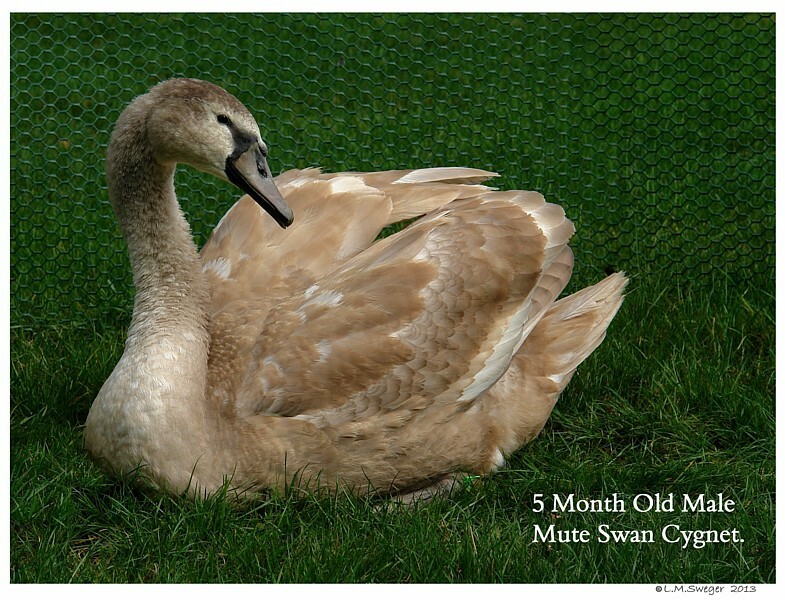 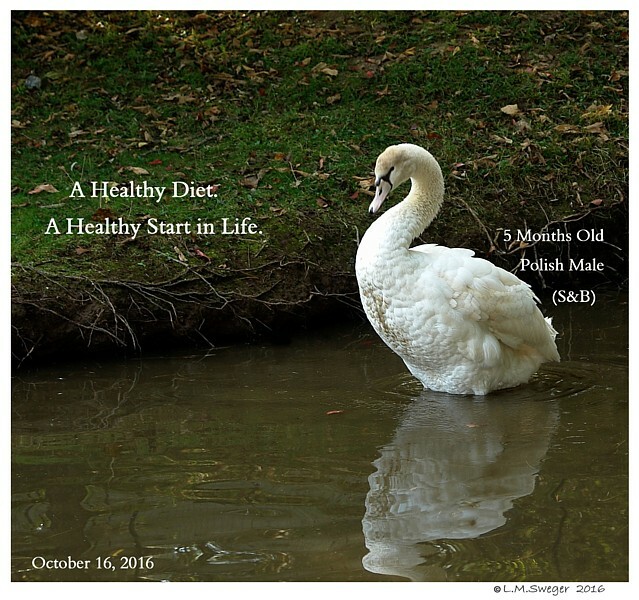 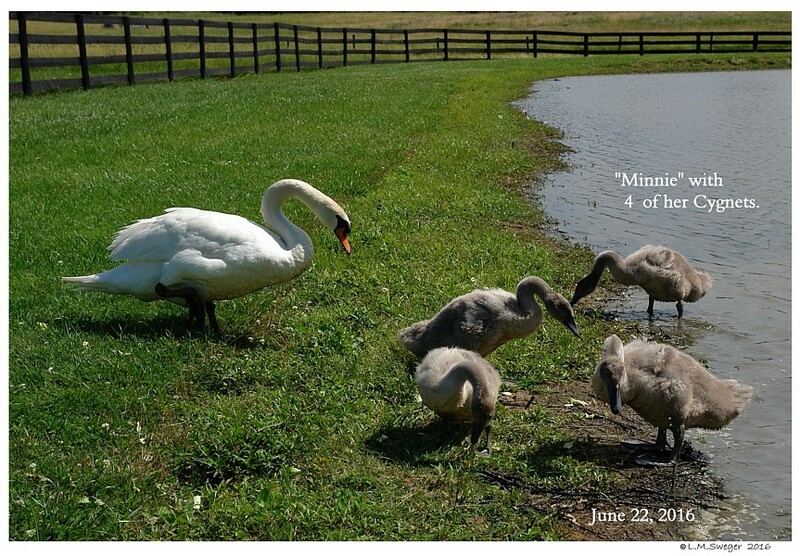 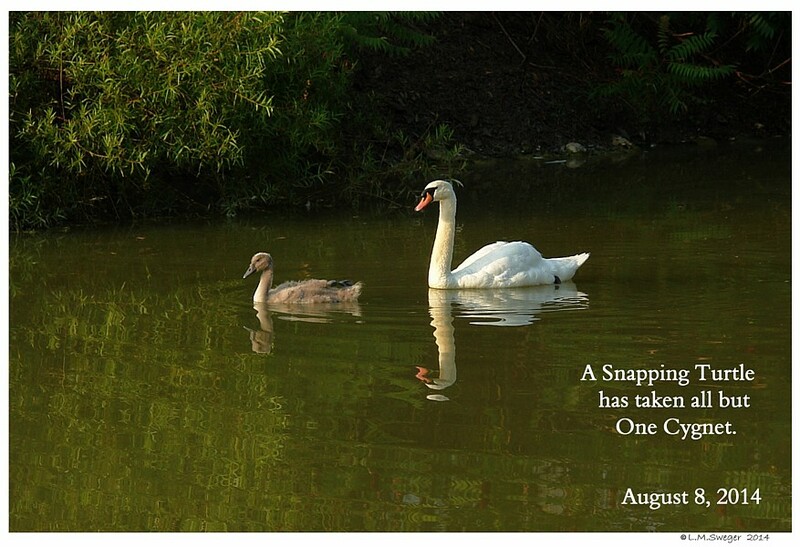 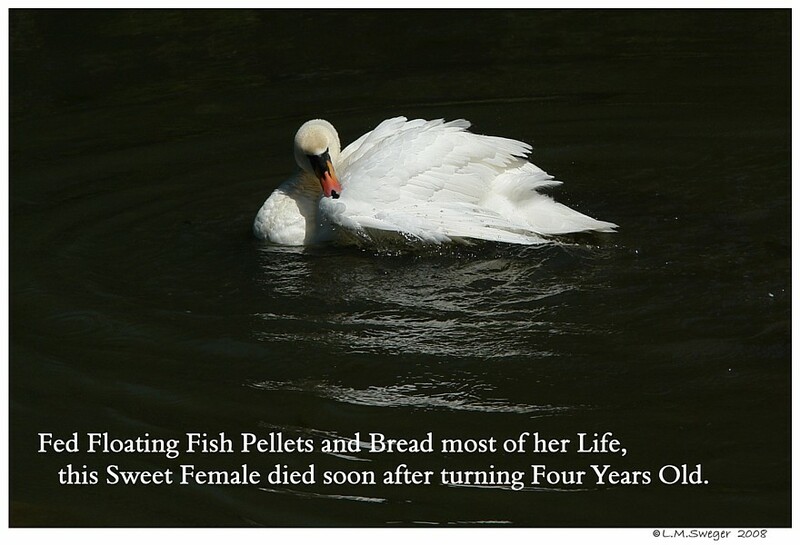 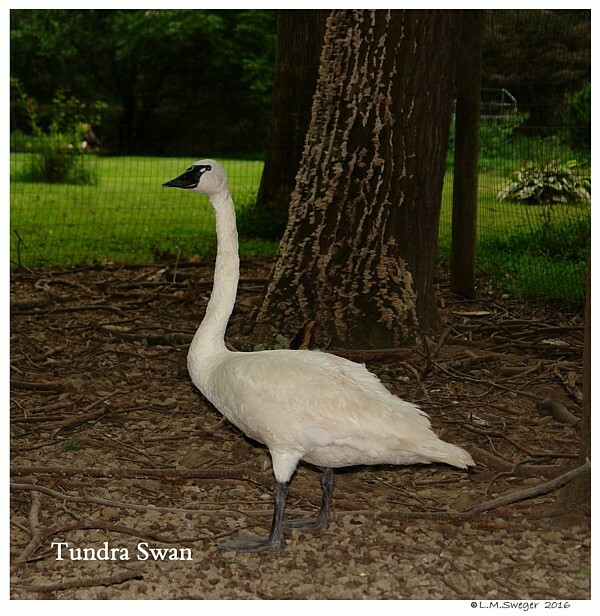 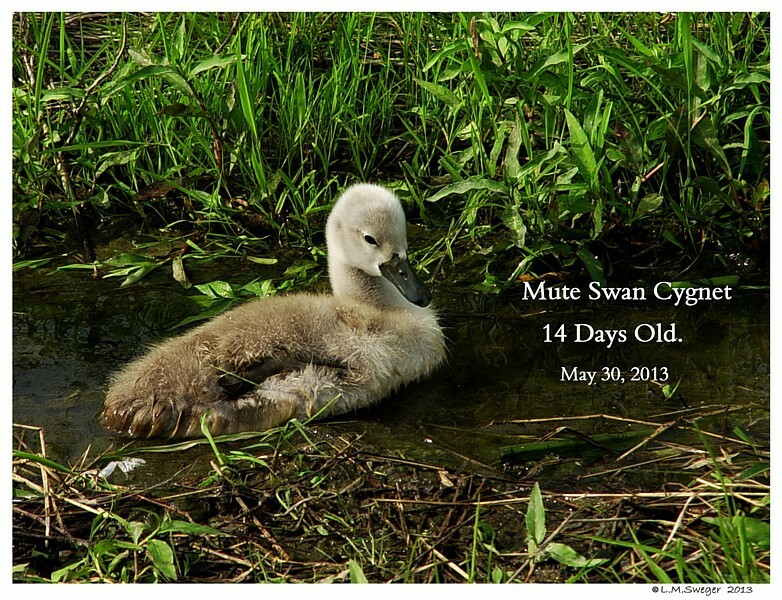 This Female Swan died as she turned Four Years Old. 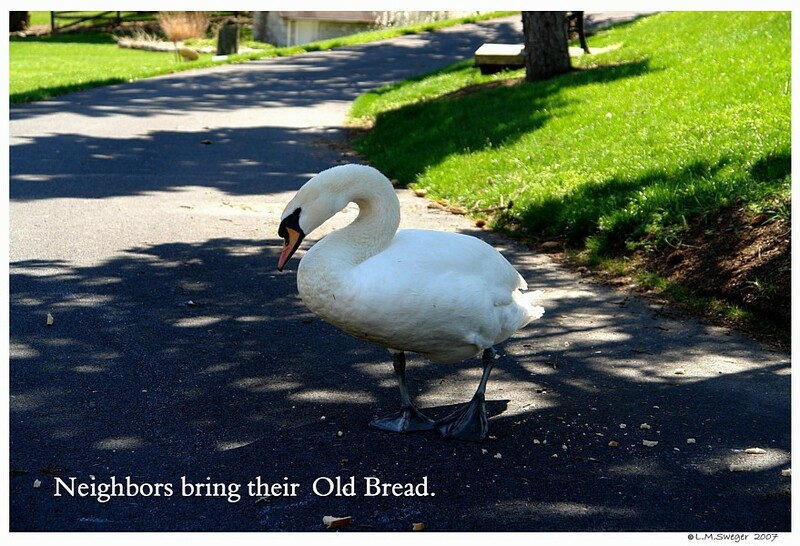 Neighbors in her Community brought their Old Bread during the warm months. 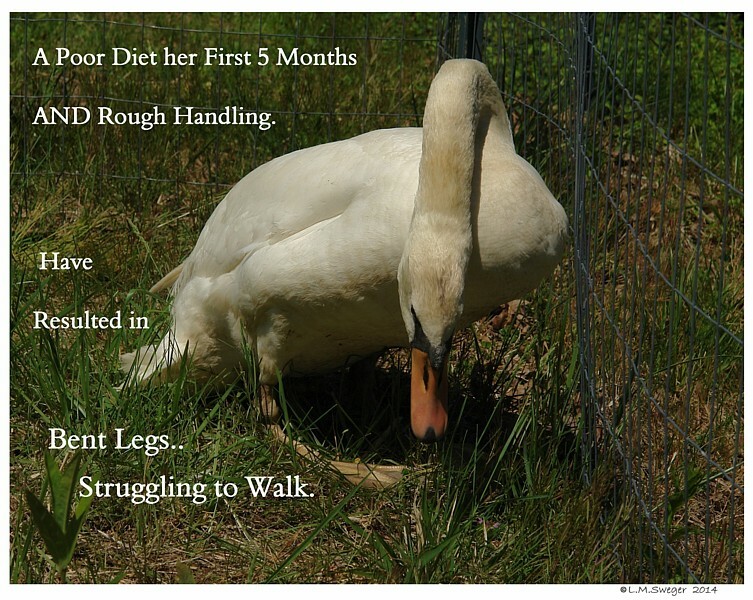 She was not fed any Proper Food by her Owners during these months. 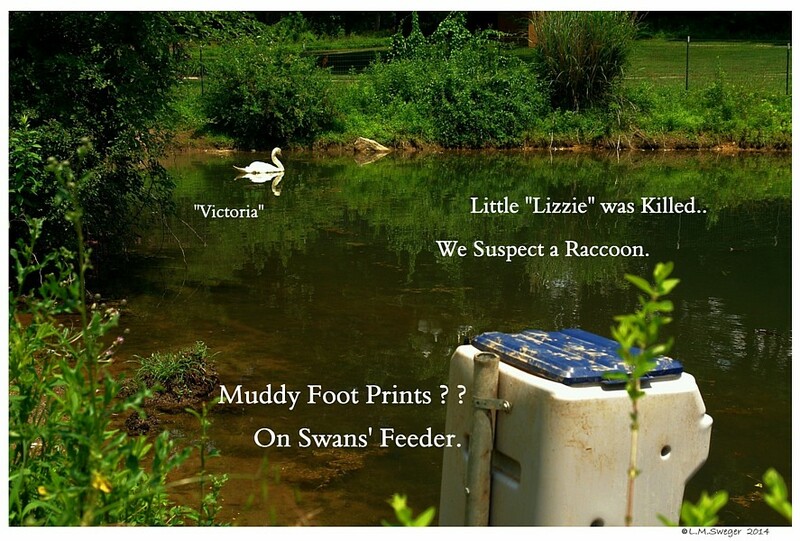 She was found dead by the Spillway of her Pond. 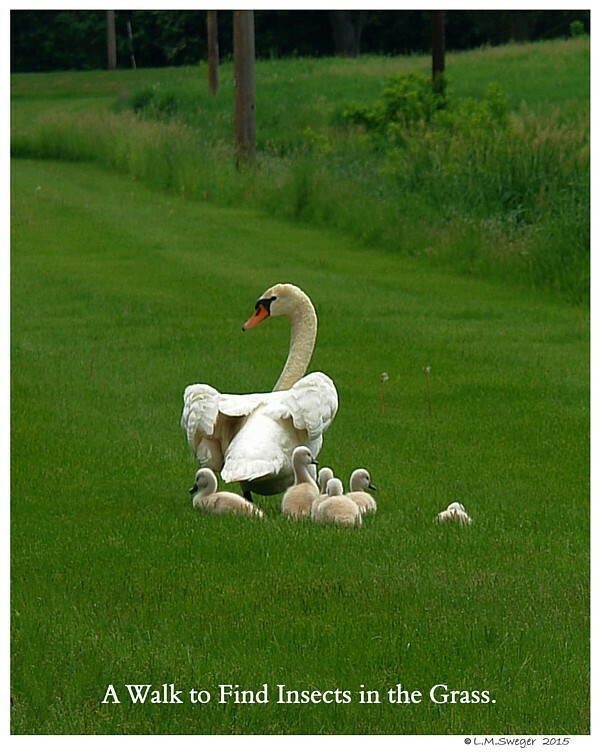 It was noted that her Neck was strangely twisted. 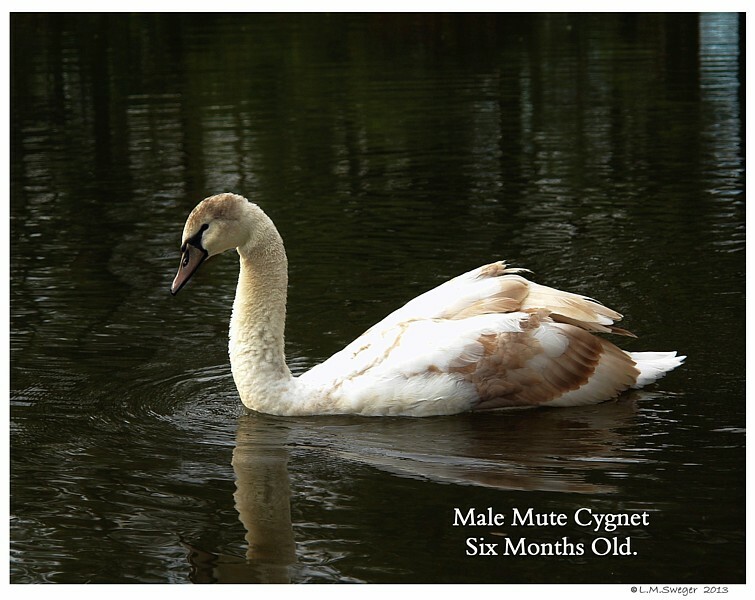 (Suggesting “Limber Neck” Disease) No Necropsy was Preformed. 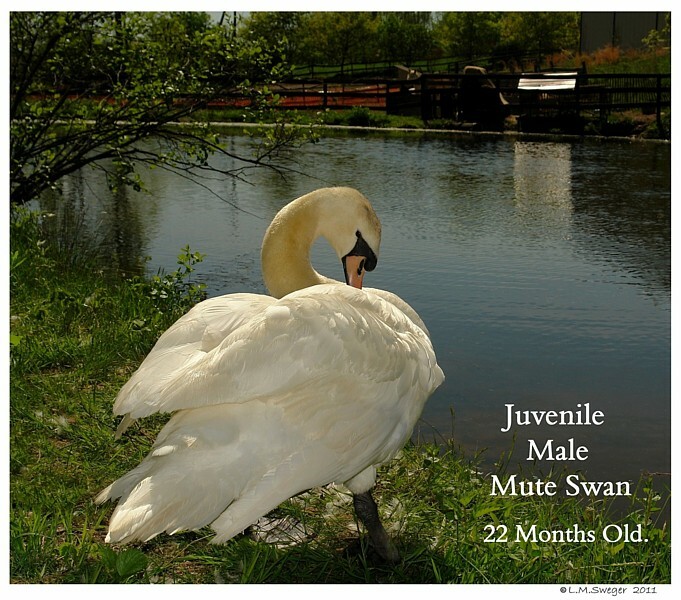 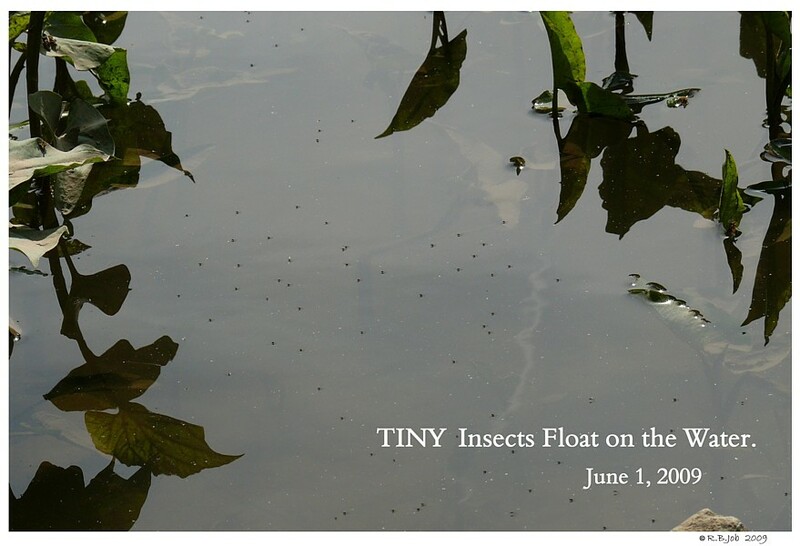 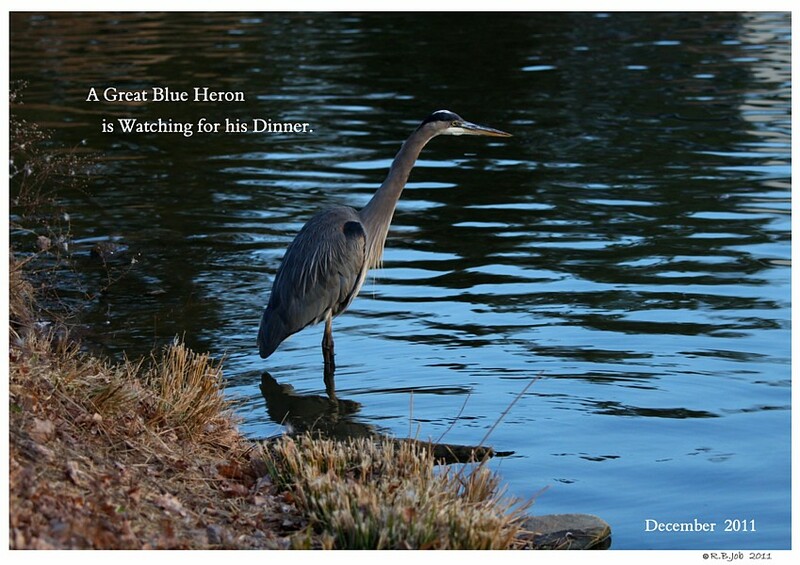 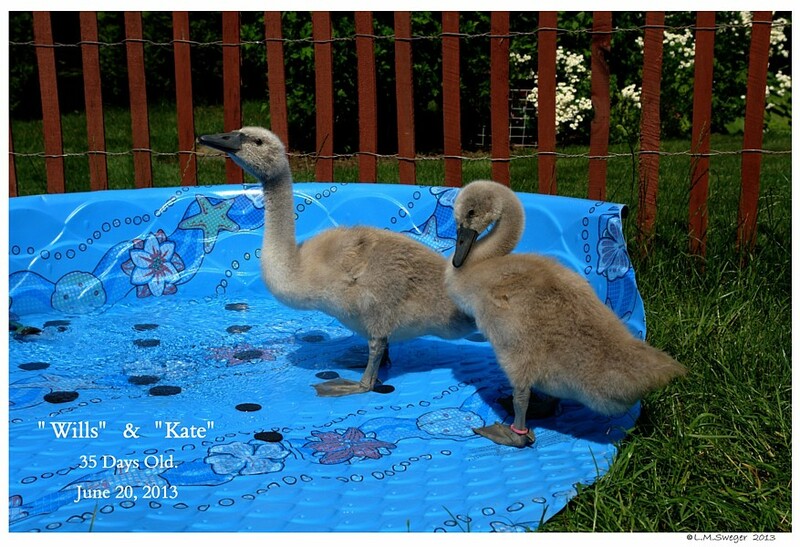 The Male on her Pond was found Dead – floating on the Pond when he was just Two Years Old. 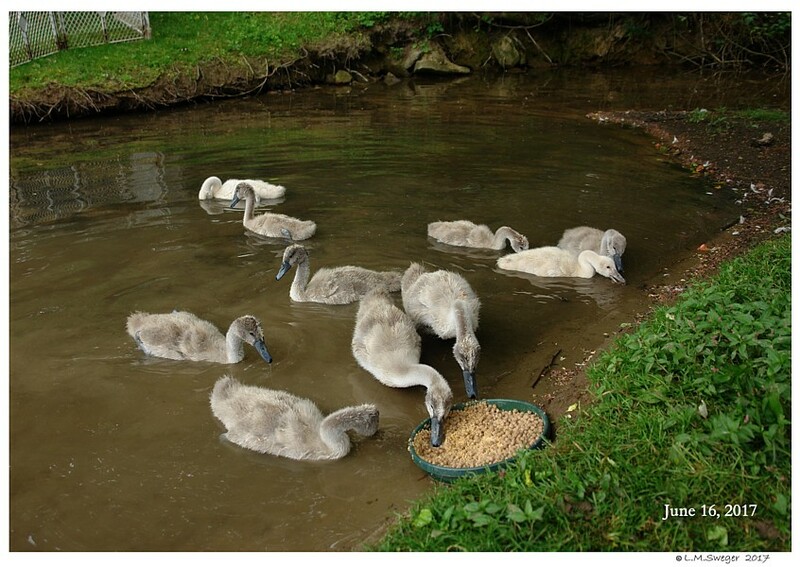 When we observe the Public at large feeding any Bird Bread, my concern is how hungry the different Birds act. 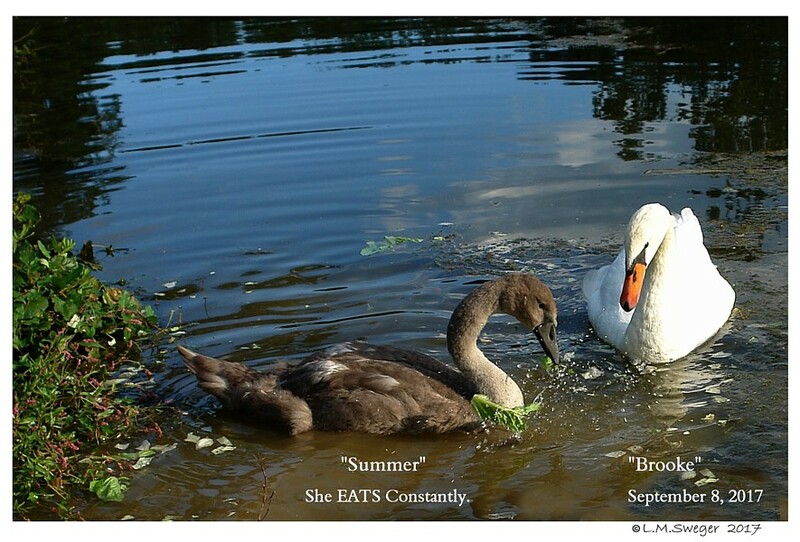 Are they acting like they are STARVING? 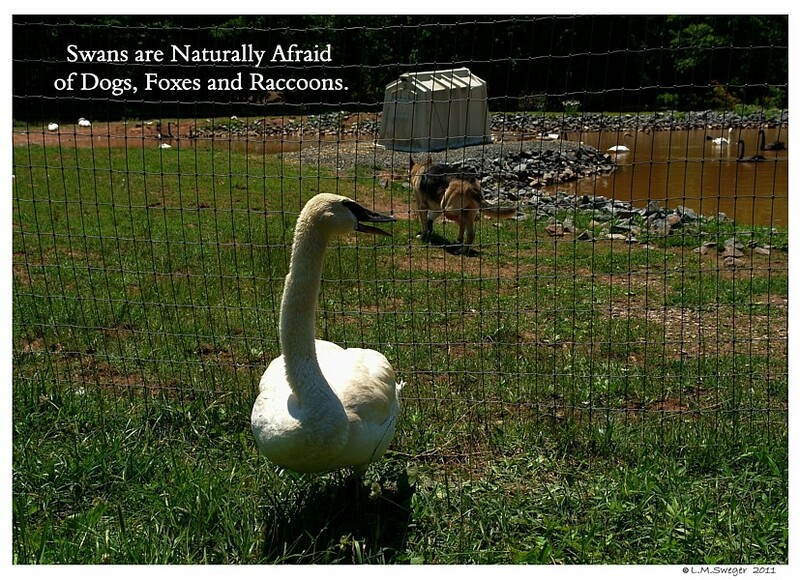 …Well they likely are !!! 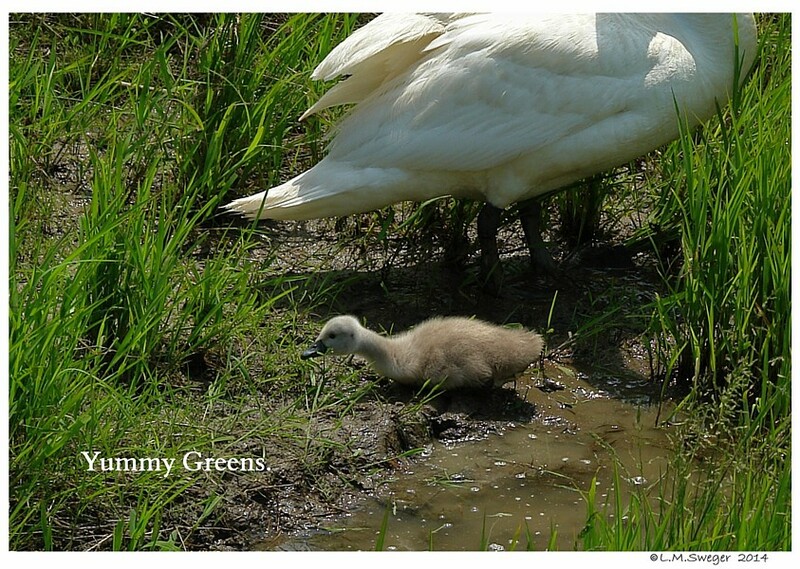 Many kind People mean well, but do more harm then good. 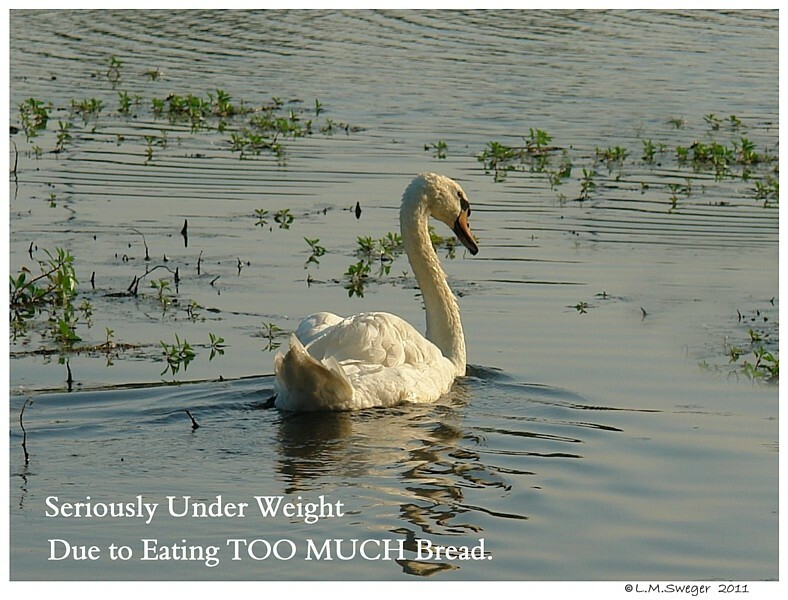 This is often a result of Birds being fed so much BREAD!!! 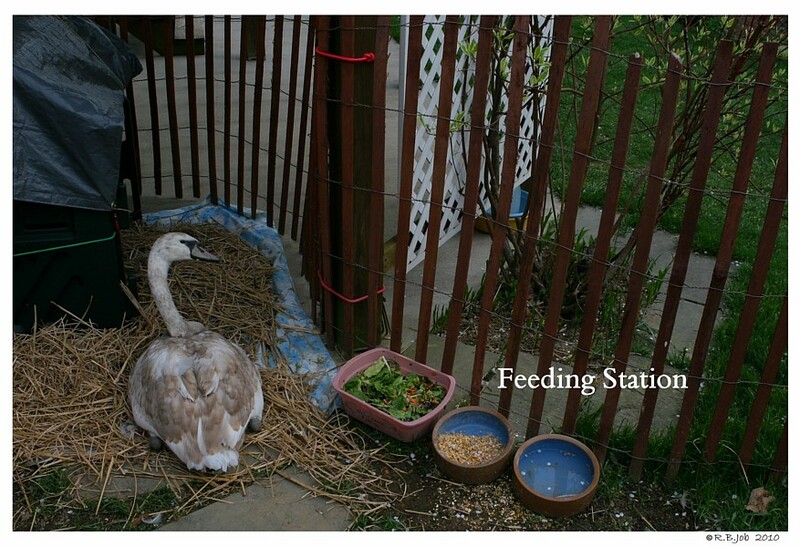 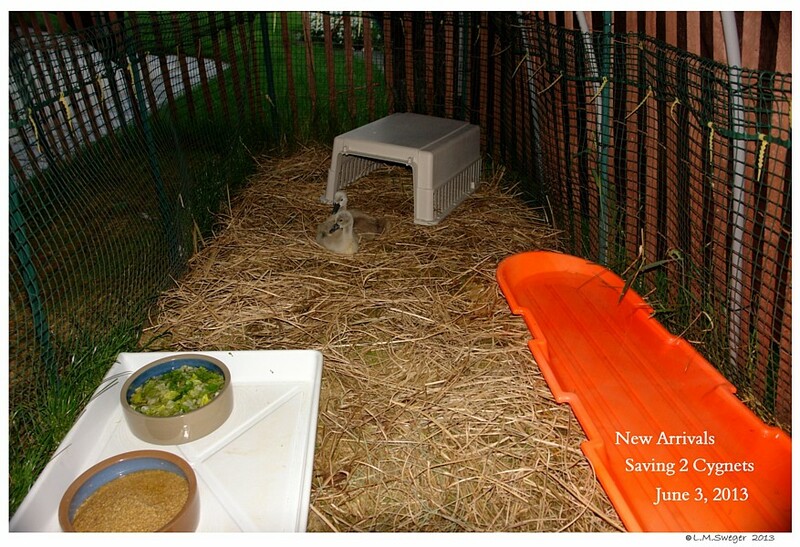 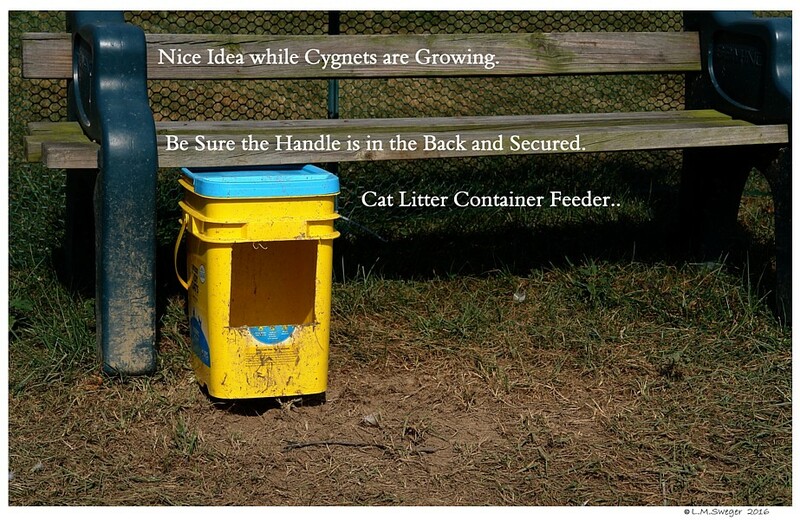 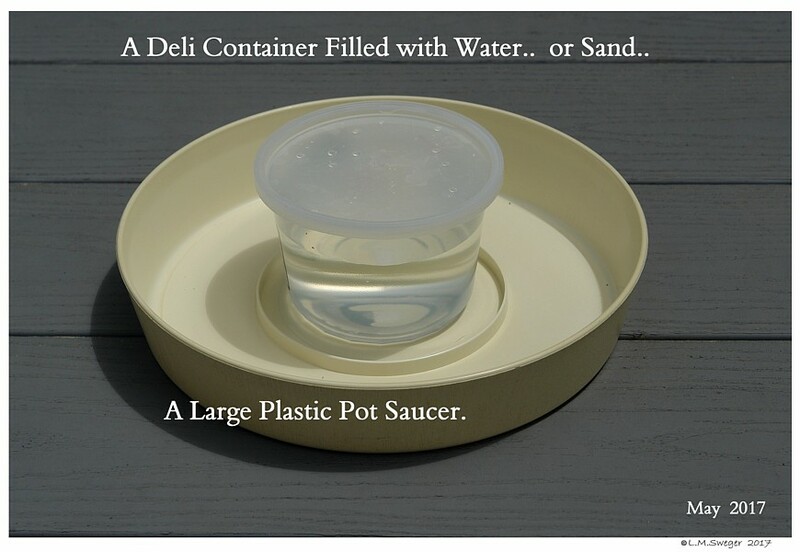 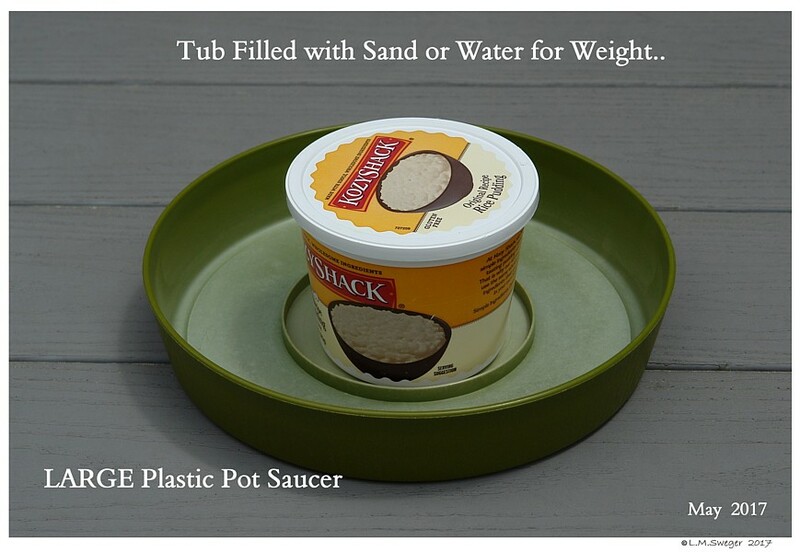 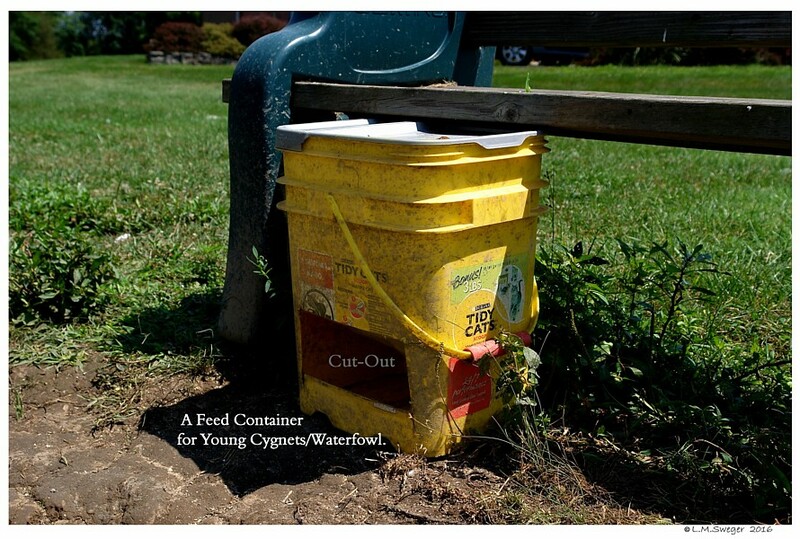 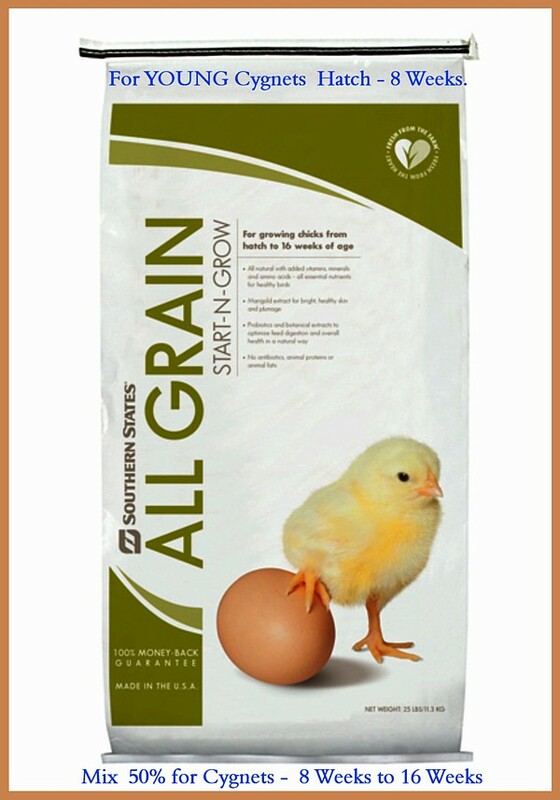 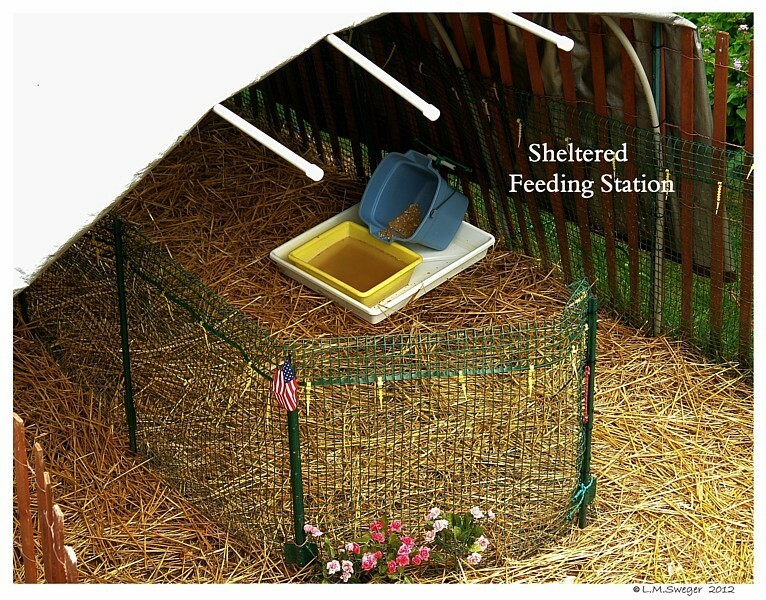 Instead of providing Food Items that will truly feed the Birds’ Nutritional needs. 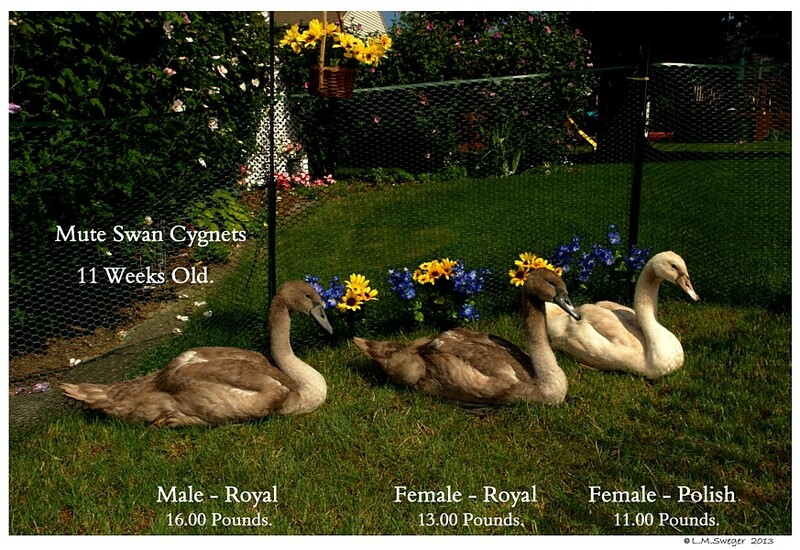 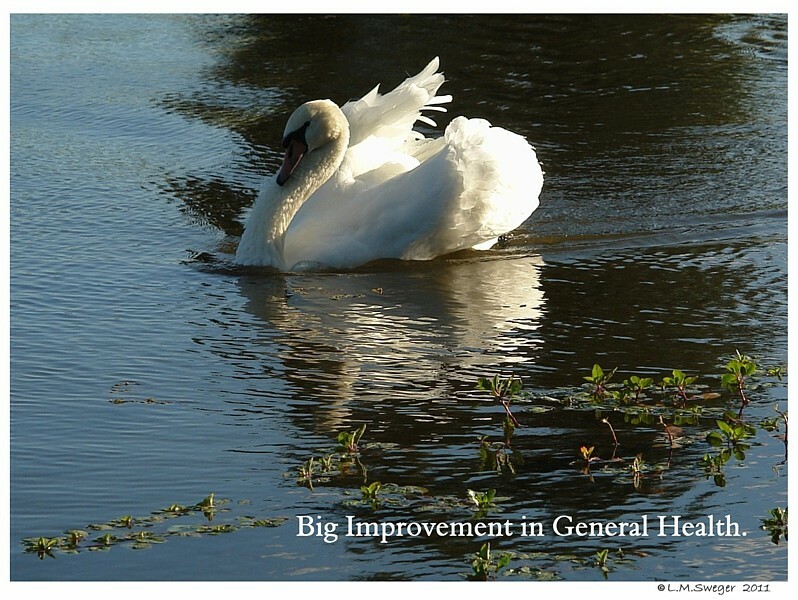 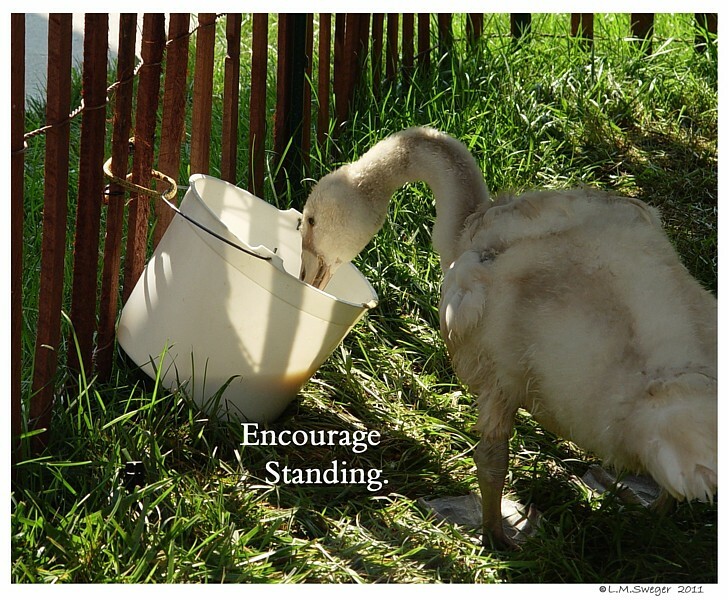 Generally, it is difficult to observed Weight Loss in Swans. 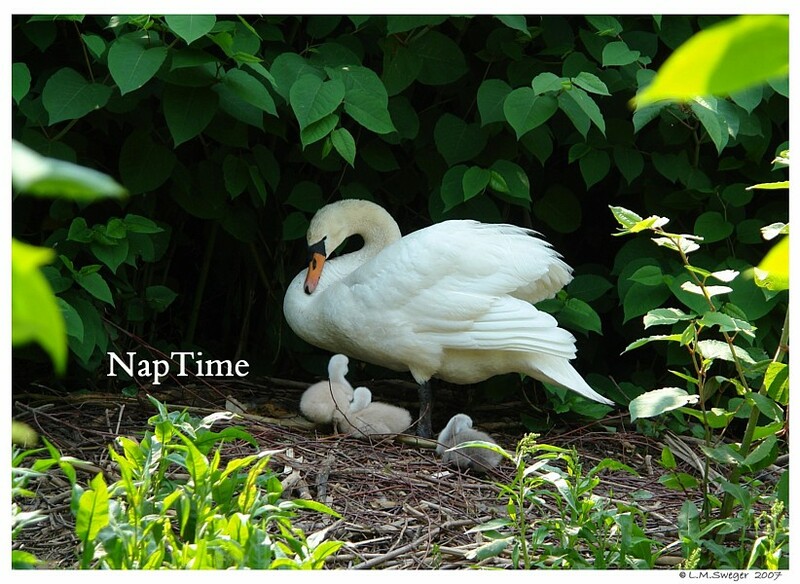 They will become less active, probably sleeping more, and will not be able to endure much stress. 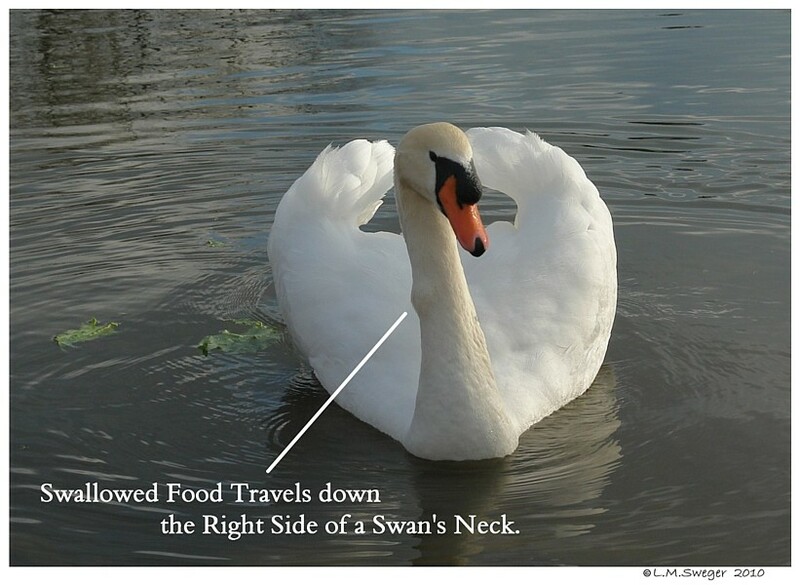 A Nutritionally Weak Swan may COLLAPSE and DIE if stressed, even for a short time. 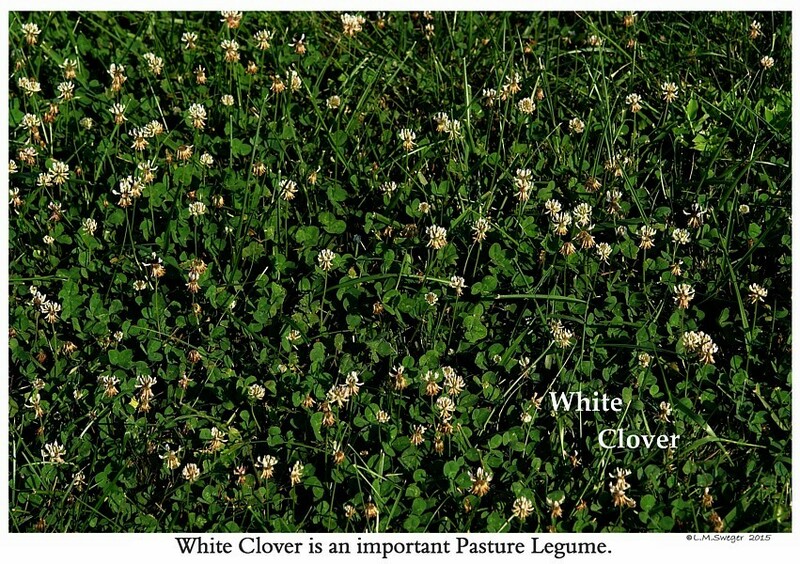 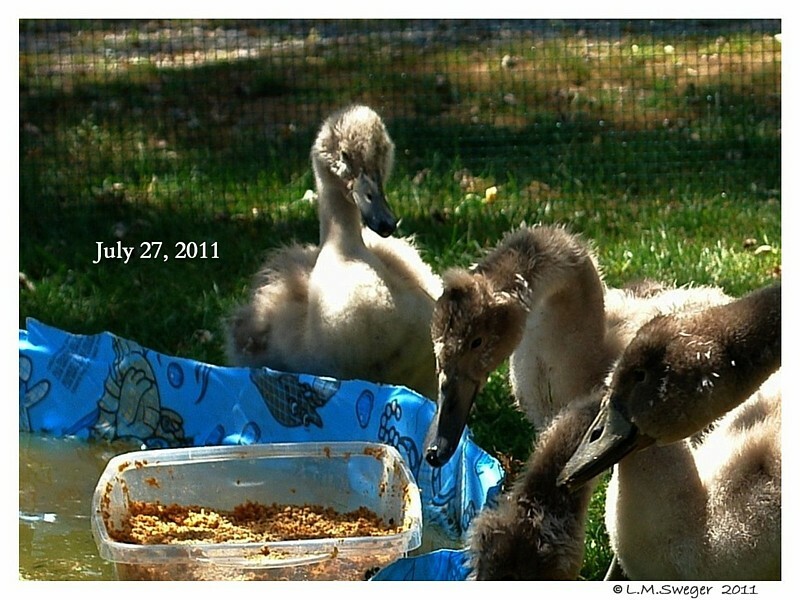 10 Reasons Why FeedingWaterfowl is Harmful. 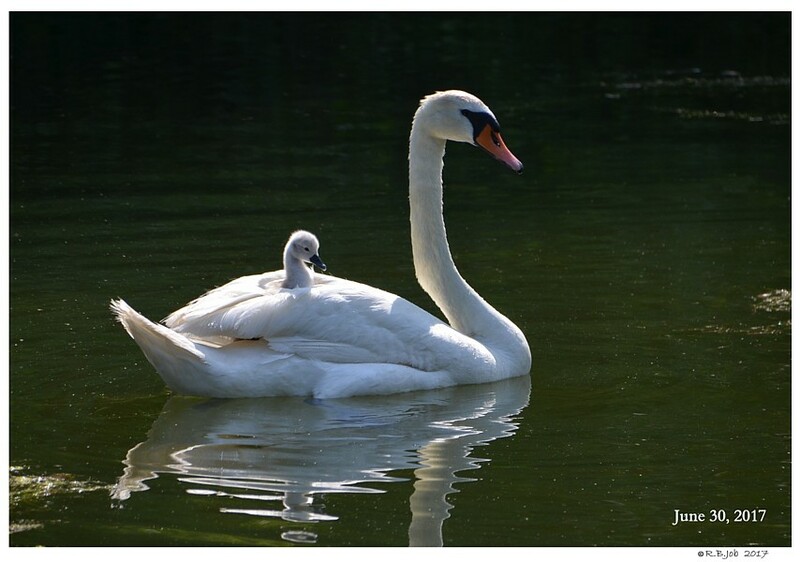 A Swan’s Body Temperature is normally 106 degrees F. Mix Bread with Water and the leftover Active Yeast will become Bread Dough in the Swan’s Gizzard. 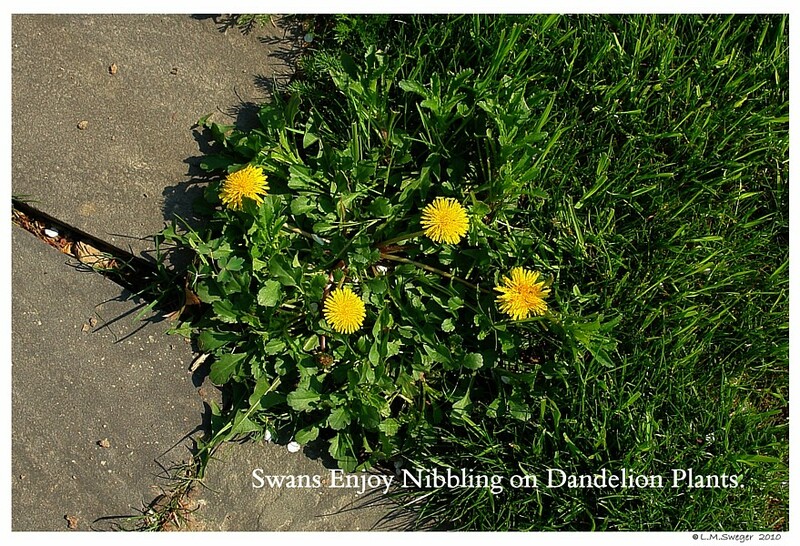 This mixture is indigestible for the Swan and may causes painful gas. 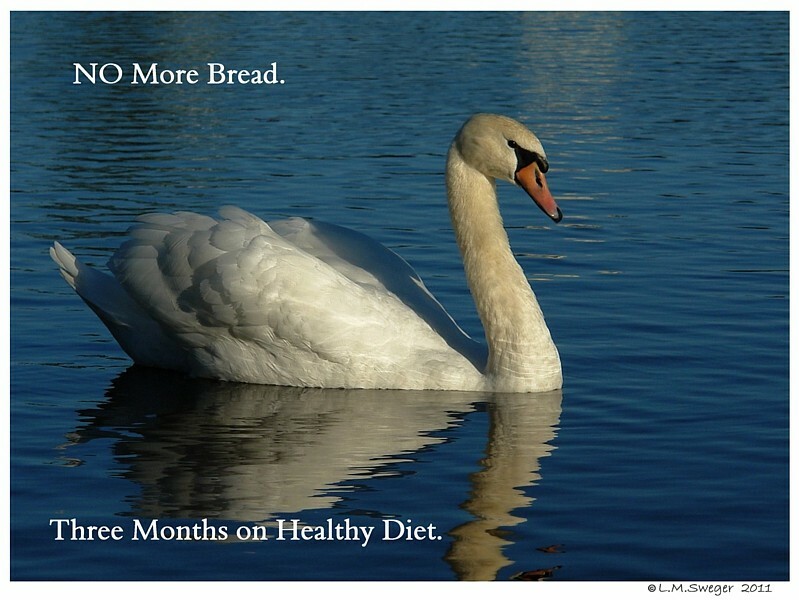 Repeated feeding of Bread will push the Good Bacteria out of the Swan’s Colon and causes Chronic Diarrhea. 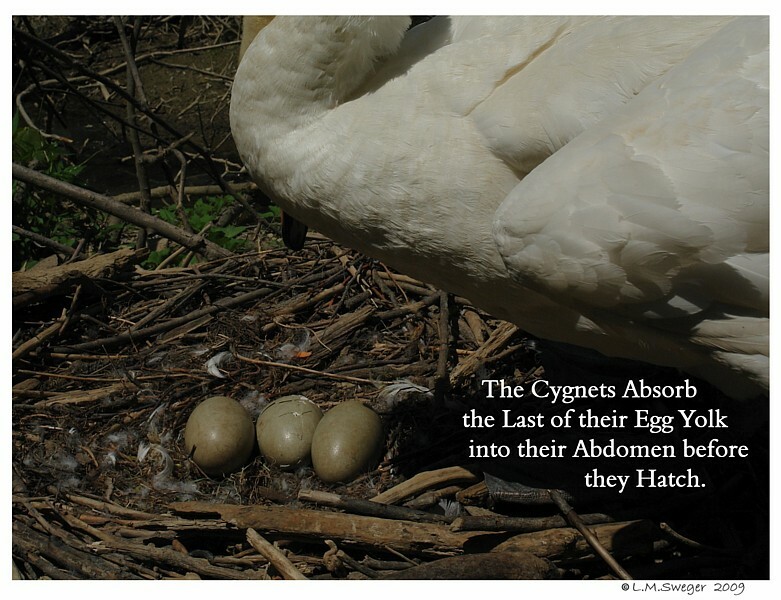 A large population of Yeast in the Swan’s Colon may cause the digestive process to be sluggish and create painful gas.. 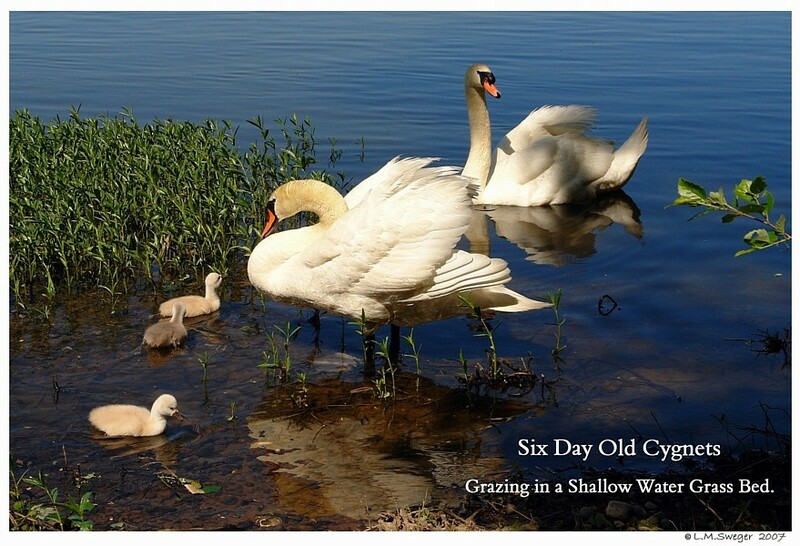 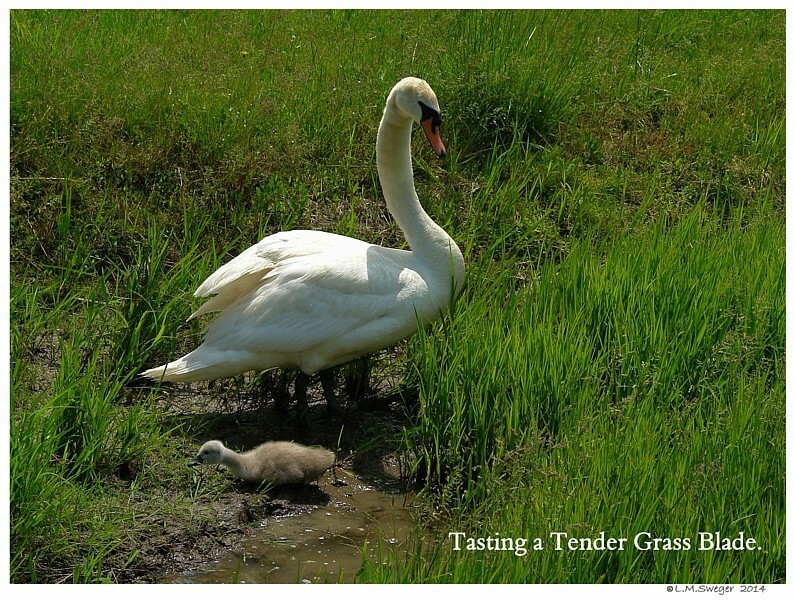 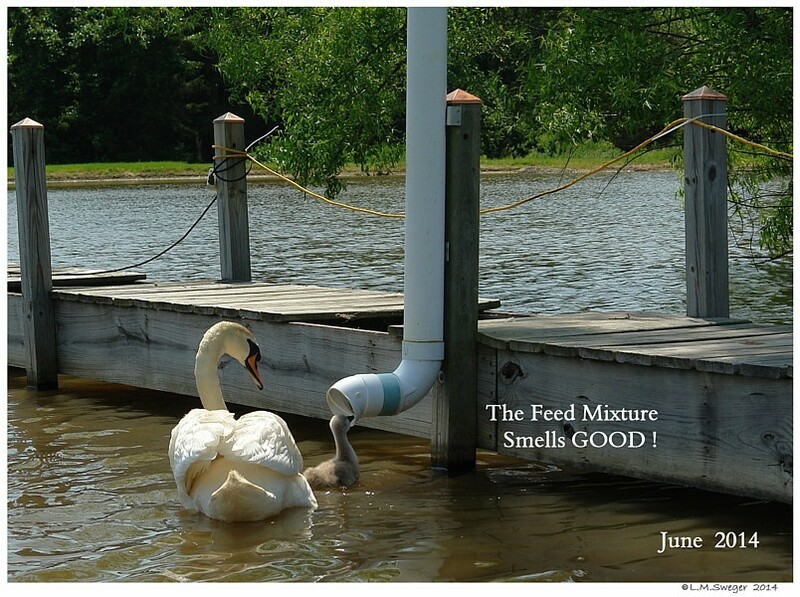 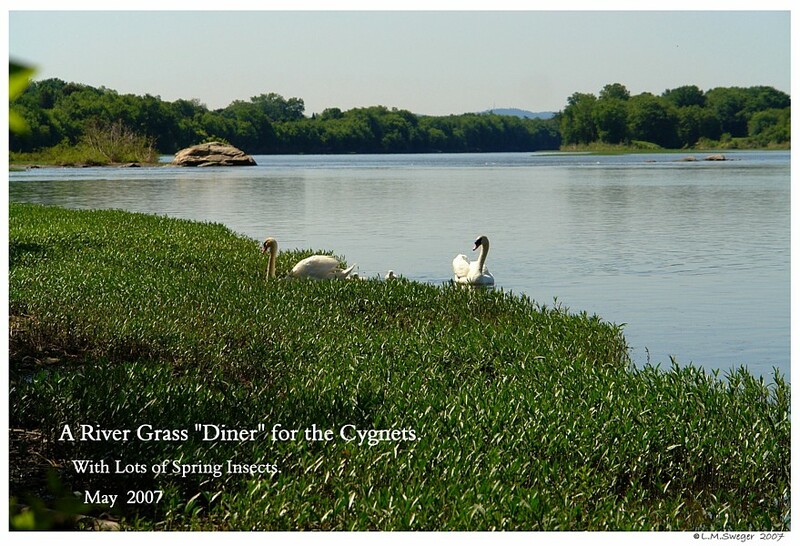 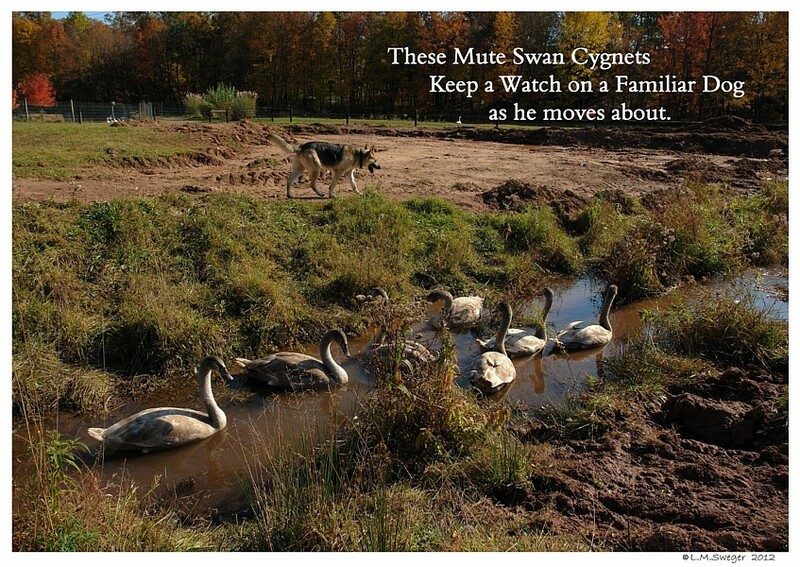 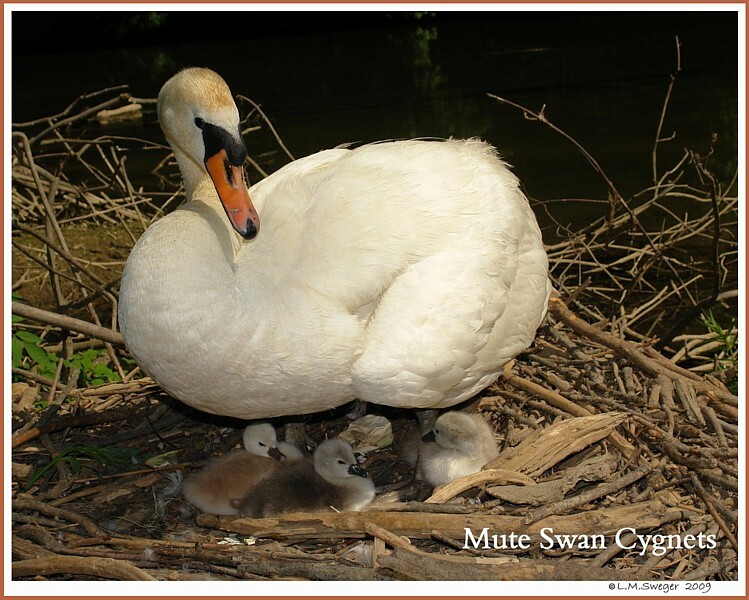 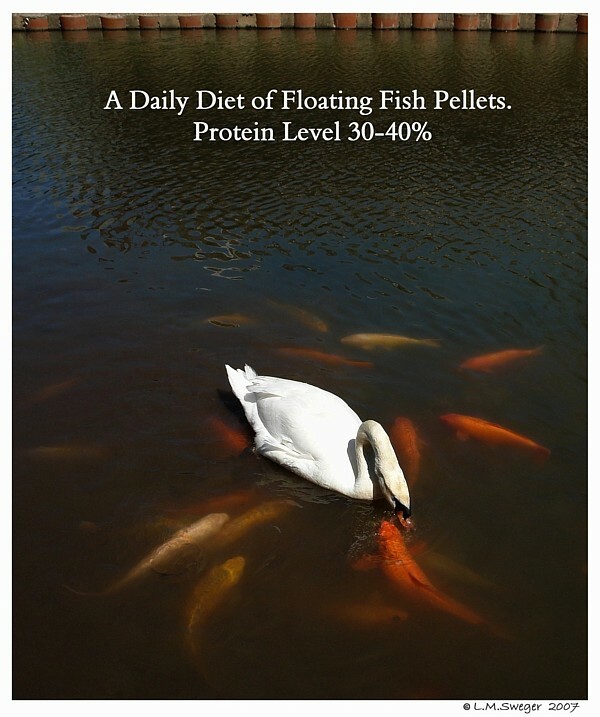 Without its normal Intestinal Bacteria the Swan cannot breakdown and absorb the Good Nutrients in their Proper Foods. 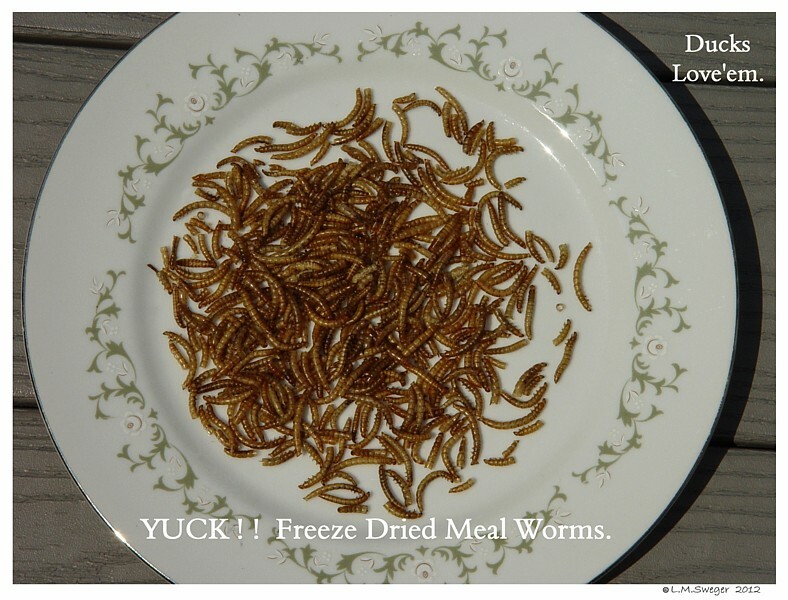 It is like Humans given a Broad Spectrum Antibiotic which wipes out our normal Intestinal Bacteria and results in Diarrhea. 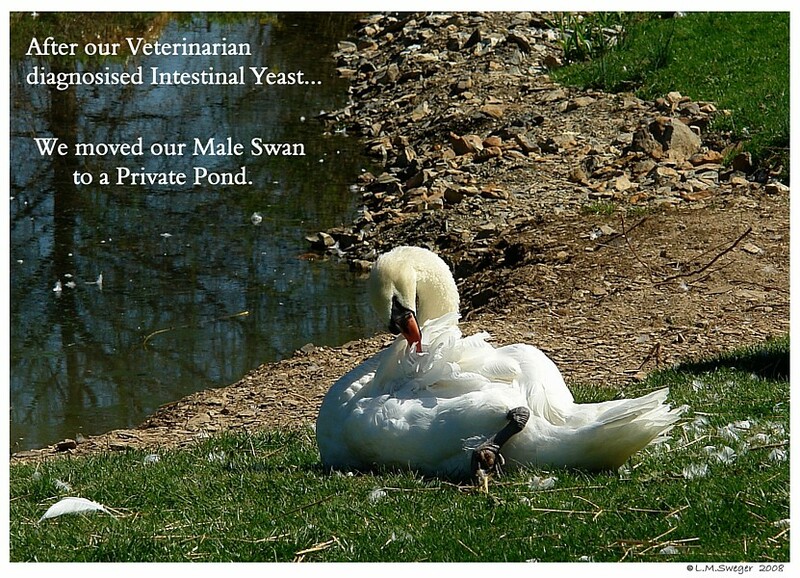 Once feeding Bread is stopped, it may take a week or so for the Good Intestinal Bacteria to become sufficent for the Diarrhea to stop… Our Veterinarian suggested we feed Probiotics Yogurt to one of our Swans when there was Yeast in his Stool. 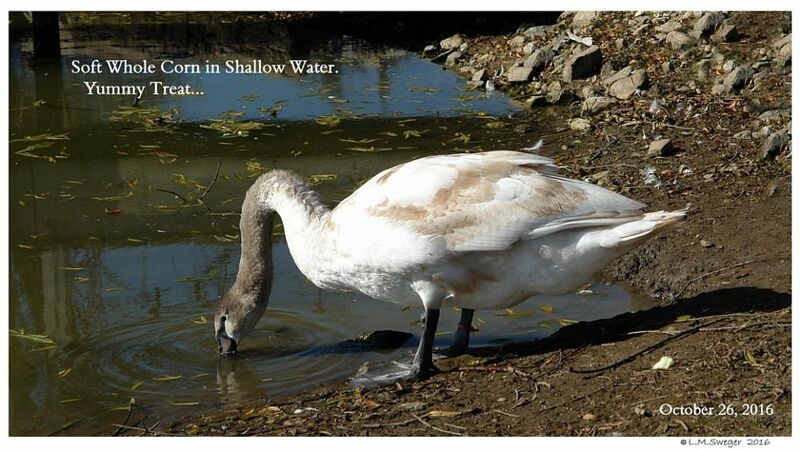 But, I could not get our Swan to eat it.. We moved him to a new Pond where the Public was unable to feed him. 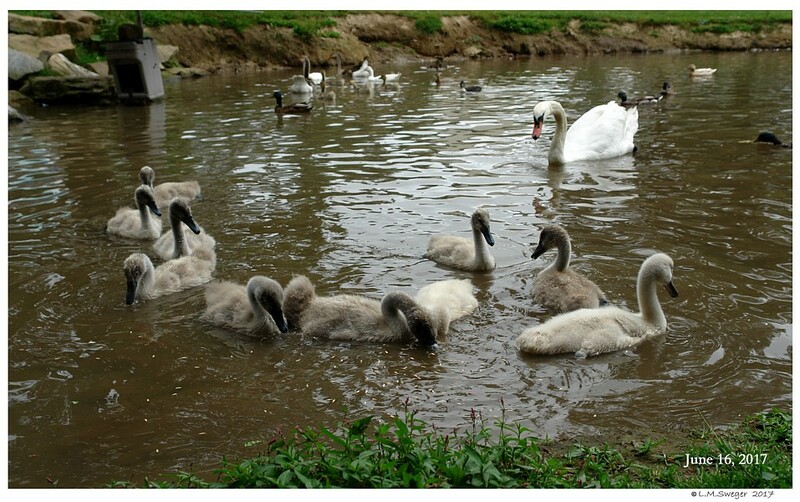 In Public Parks and Waterways where the Public is allowed to feed Swans Bread freely, the Swans fed large amounts of Bread will be eating and starving to death at the same time. 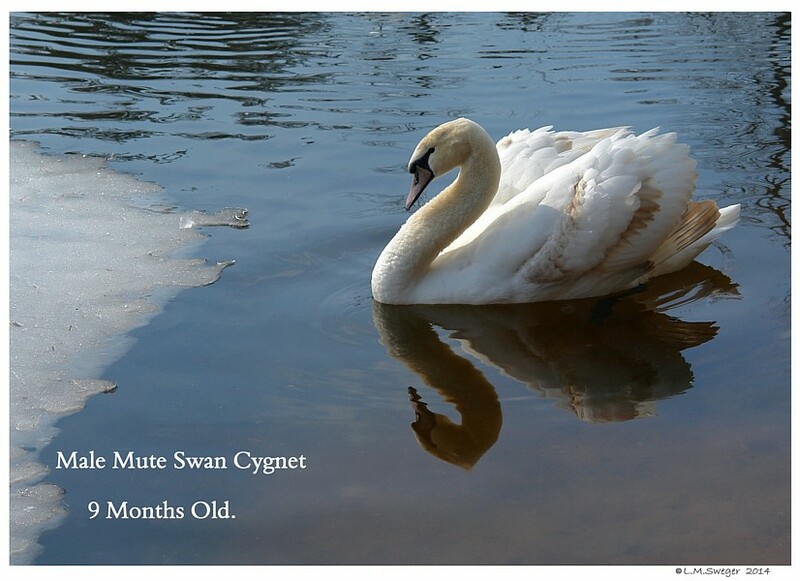 It is common for a more then average number of those Swans to die over the Winter. 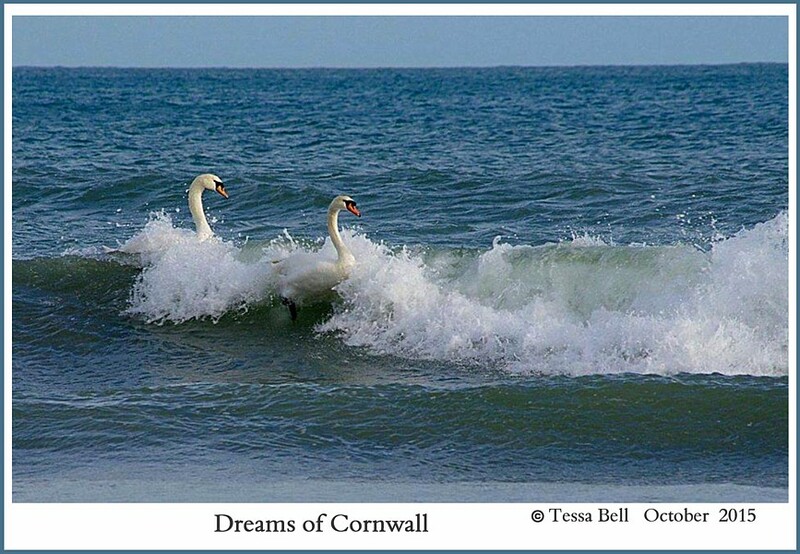 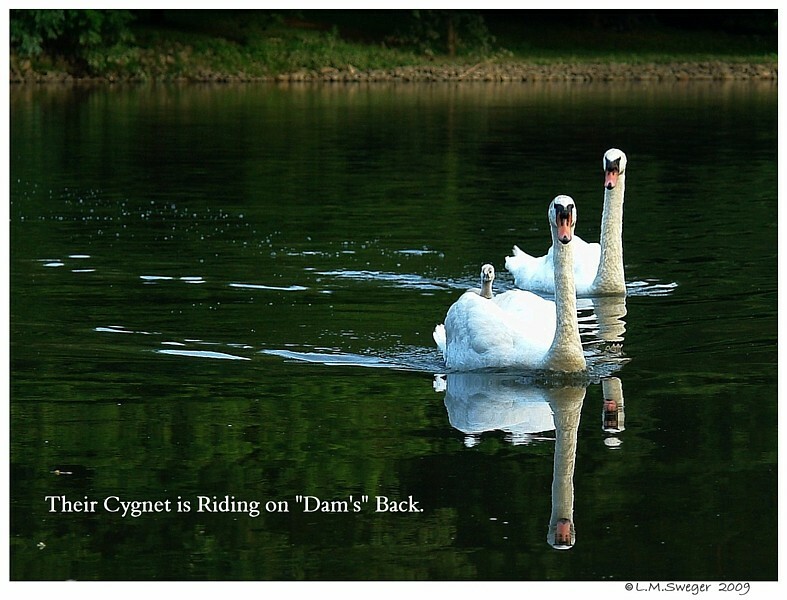 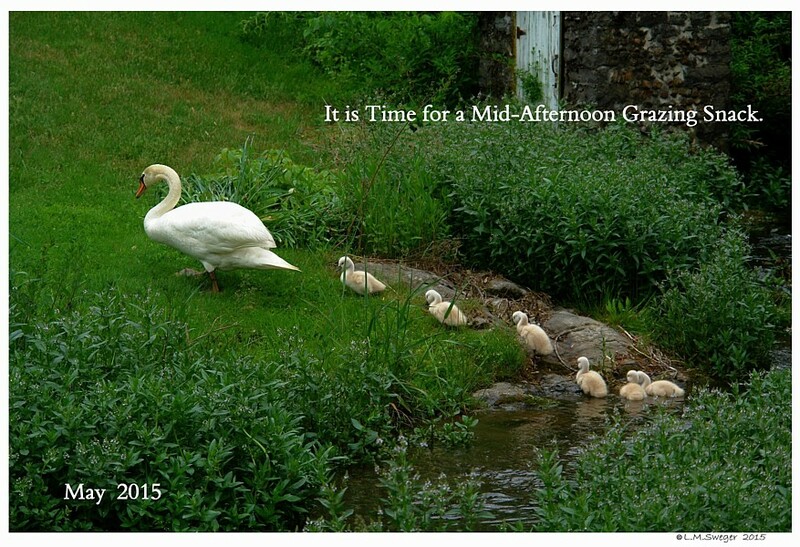 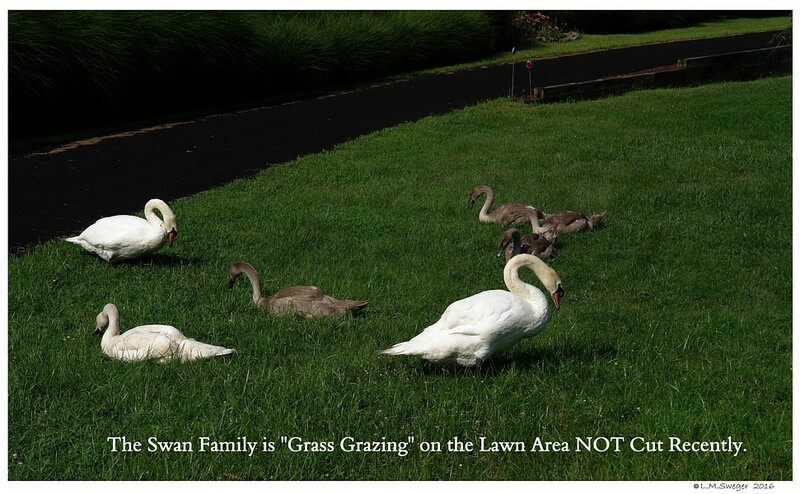 The general Public is unaware that these Swans may just be replaced the following Spring. 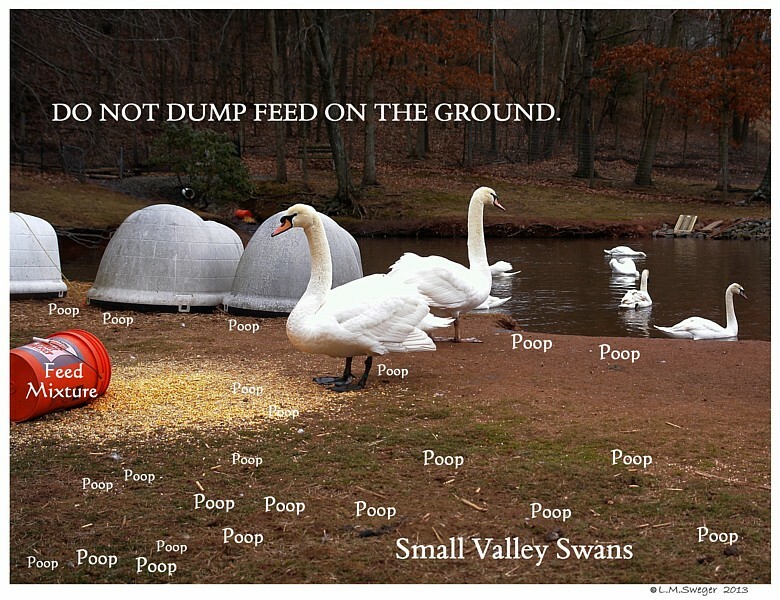 This is one reason many place have stopped having Swans – it becomes too expensive, as well as time consuming to keep replacing them. 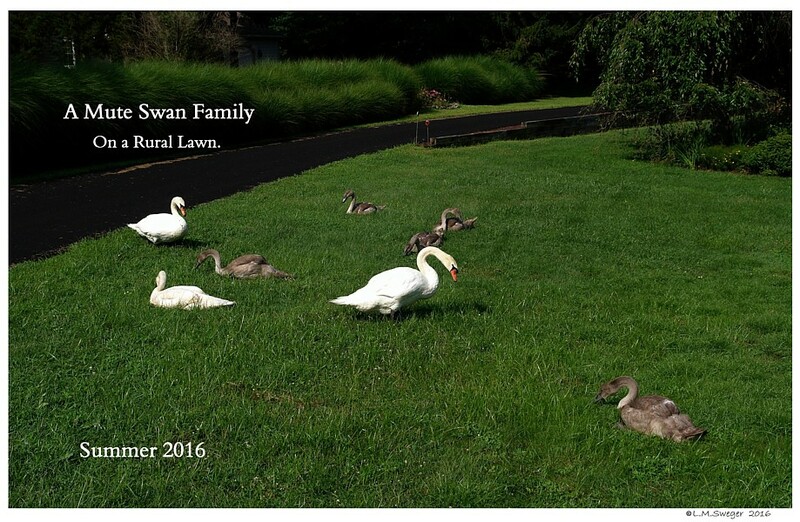 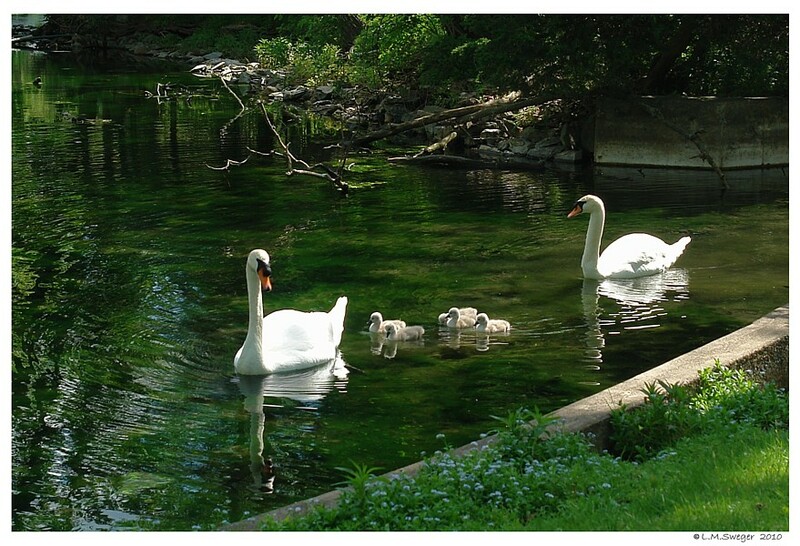 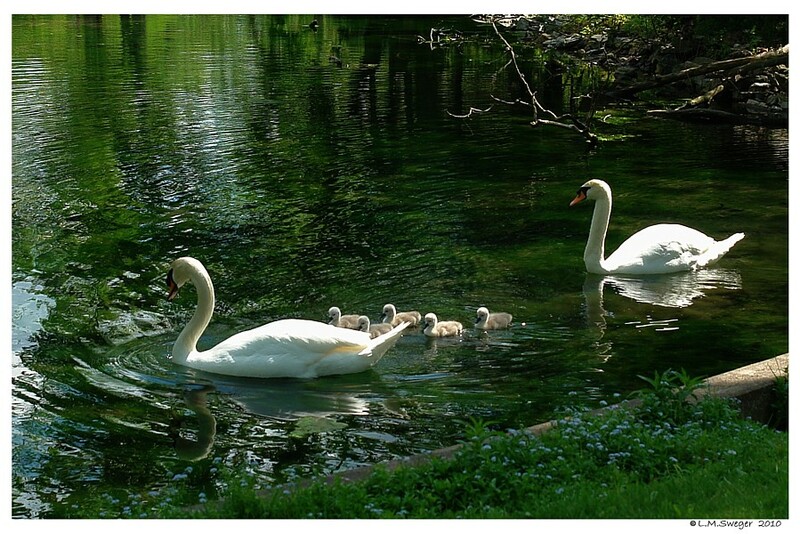 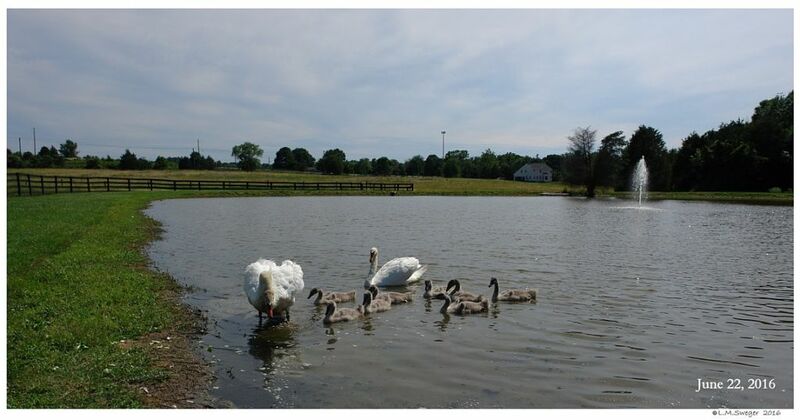 The Swans at Italian Lake, in Harrisburg are a good example. 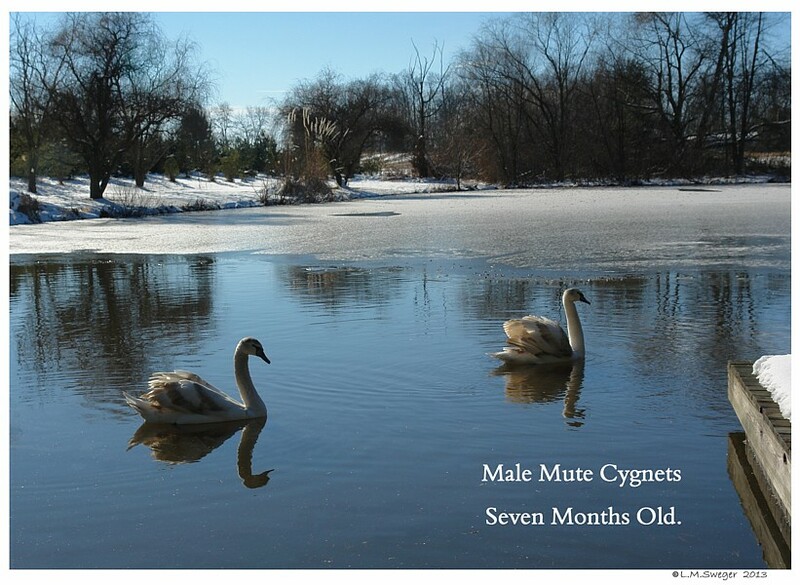 Years ago there were Swans gracing this Public Lake. 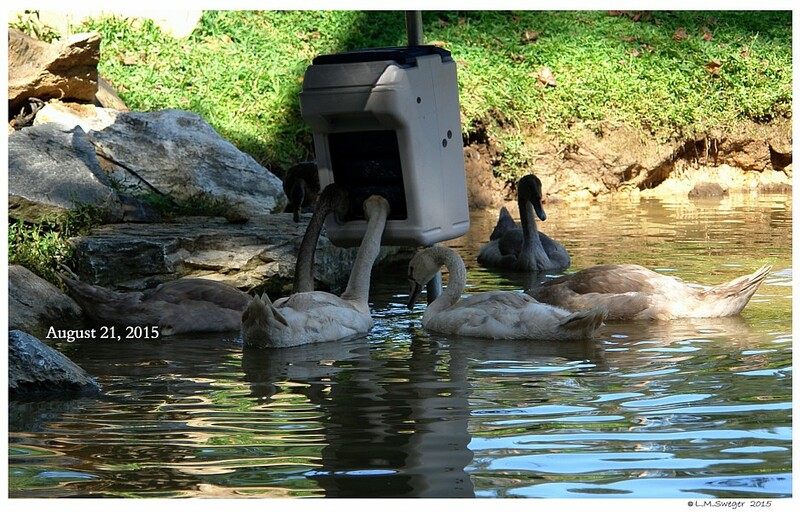 All day long well meaning People were bringing leftover bread to feed these Swans. 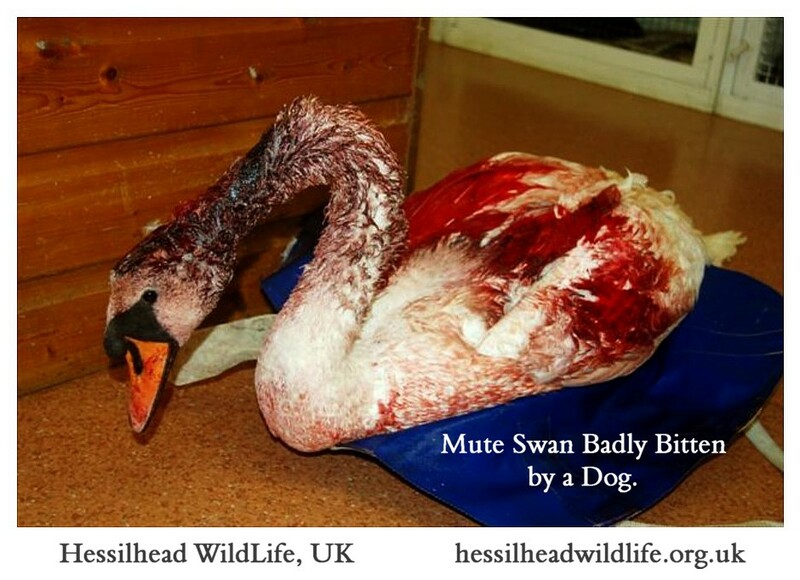 When the Swans showed signs of illness, it was too late to help them.. Efforts to save them failed. 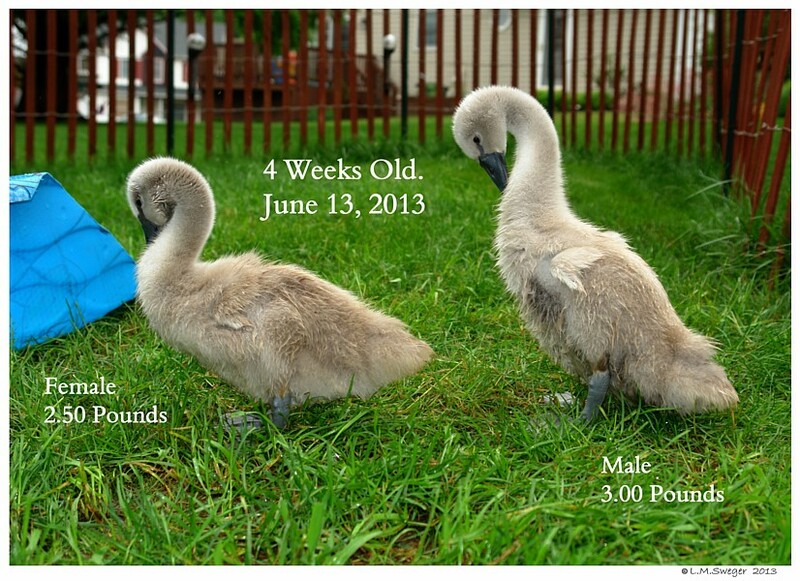 The City did not replace them. 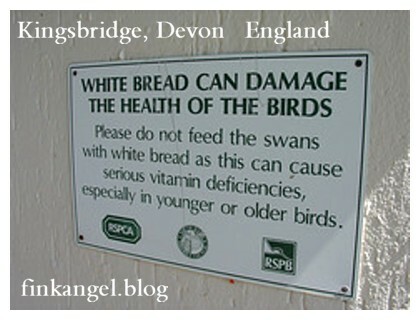 In England, they are now posting signs – “DO NOT FEED SWANS BREAD”. 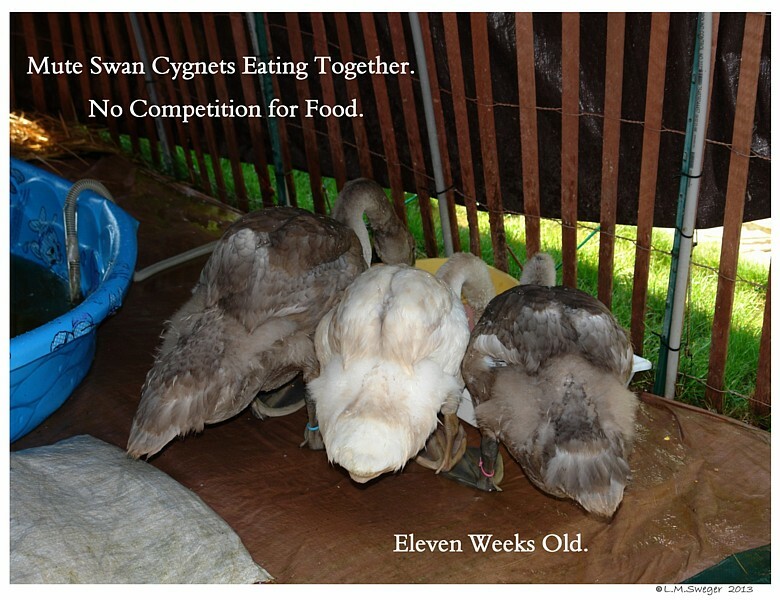 They lose thousands of Swans to Bread Starvation every year. 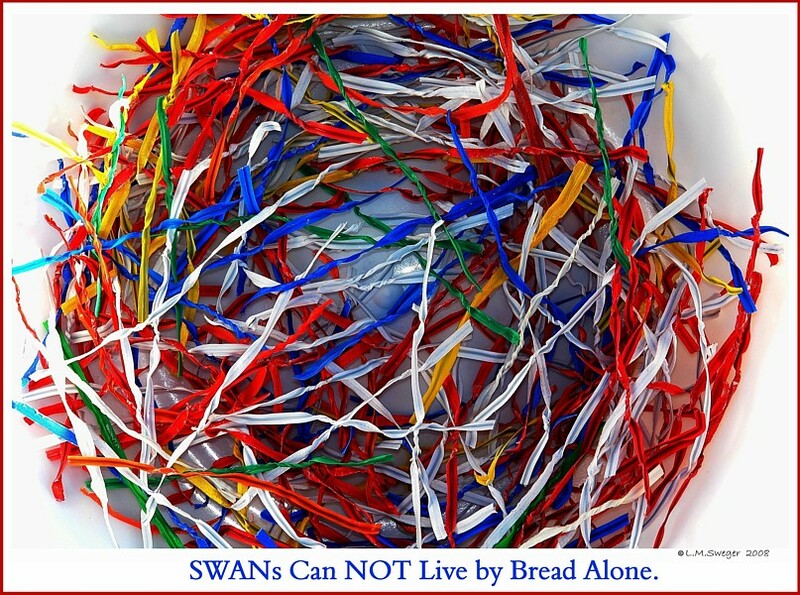 IF BREAD HAS MOLD: ANY Mold on old bread may cause a Swan to die within a week… Bread Mold in the slow moving digestive system of a Swan will allow time for the Dangerous Toxins excreted by some Molds to concentrate and POISON the Swan. 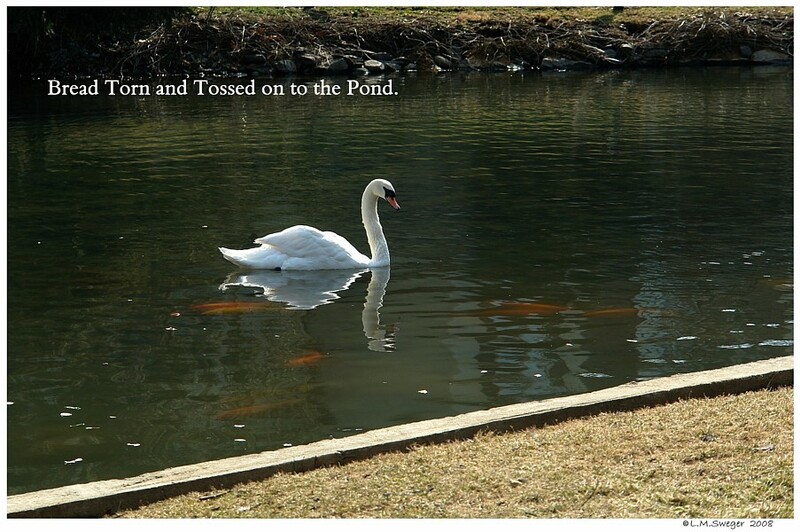 This is very, very difficult to reverse once it is inside the Swan’s body. 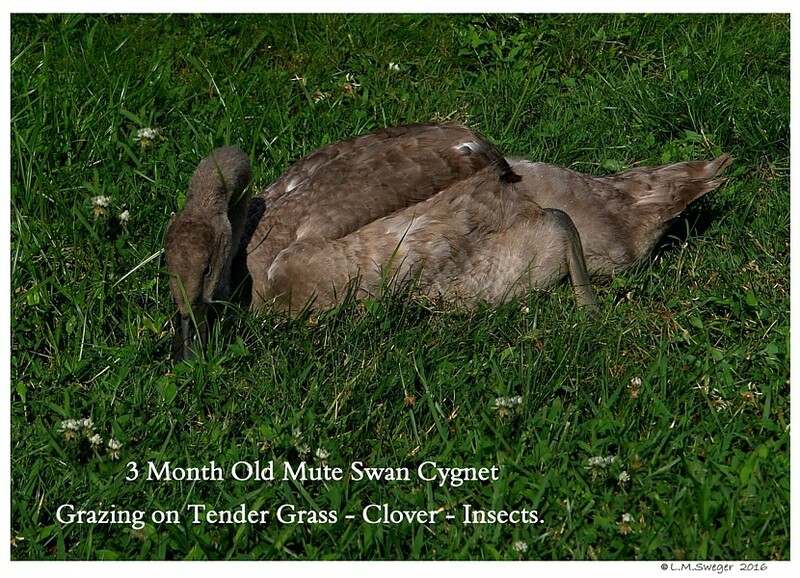 “Limber Neck” disease is a fatal infection of Botulism affecting Birds. 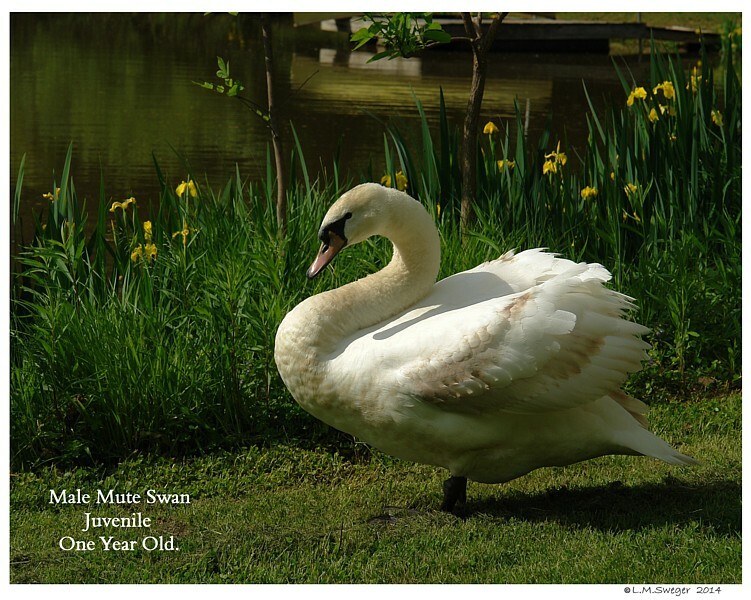 It is characterized by weakness of the neck muscles and inability to eat. 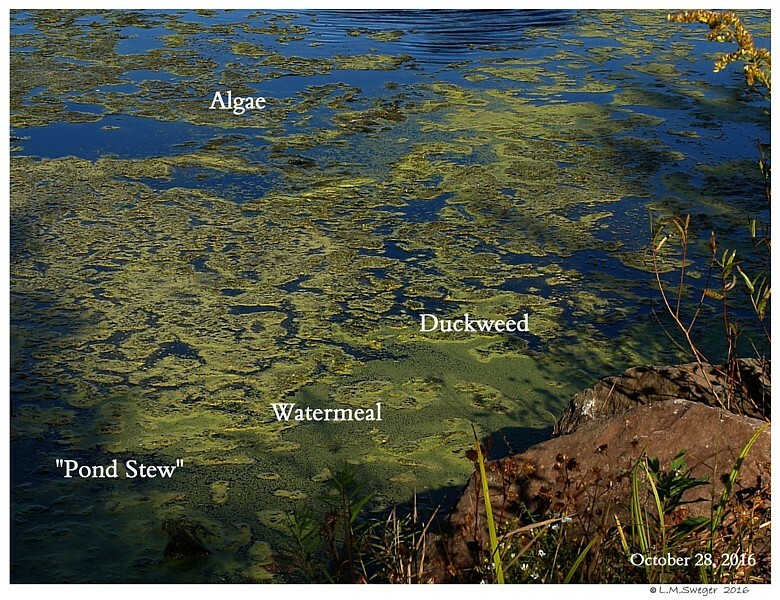 Old Bread laying in water during hot weather months may cause deadly Clostridia Botulism and other Pathogenic Bacteria to form. 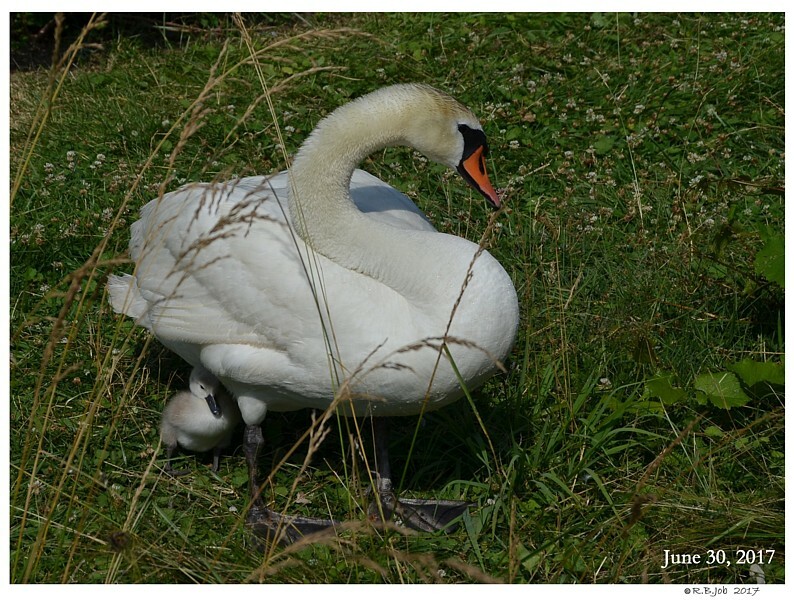 A fatal infection of Botulism affecting Birds, characterized by weakness of the neck muscles and inability to eat. 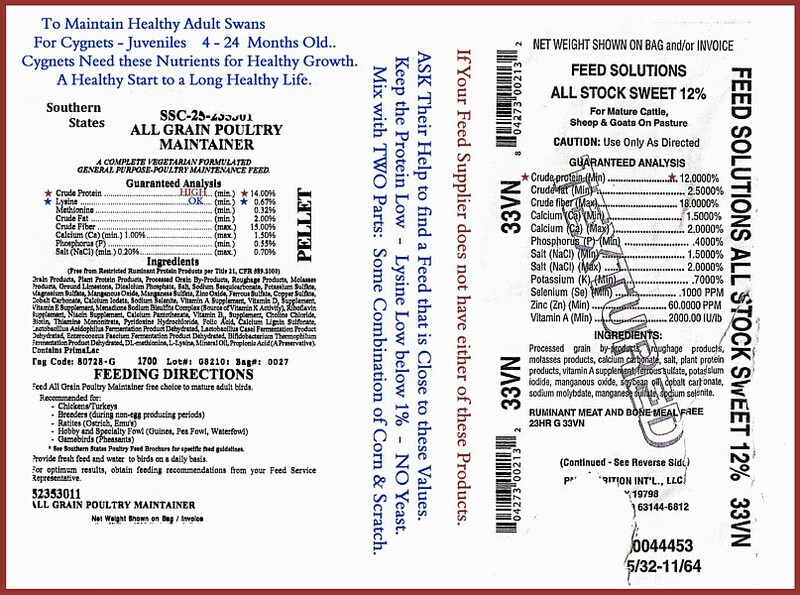 From Wikipedia: B. Botulinum toxin is a protein and neurotoxin produced by the bacterium Clostridium botulinum. 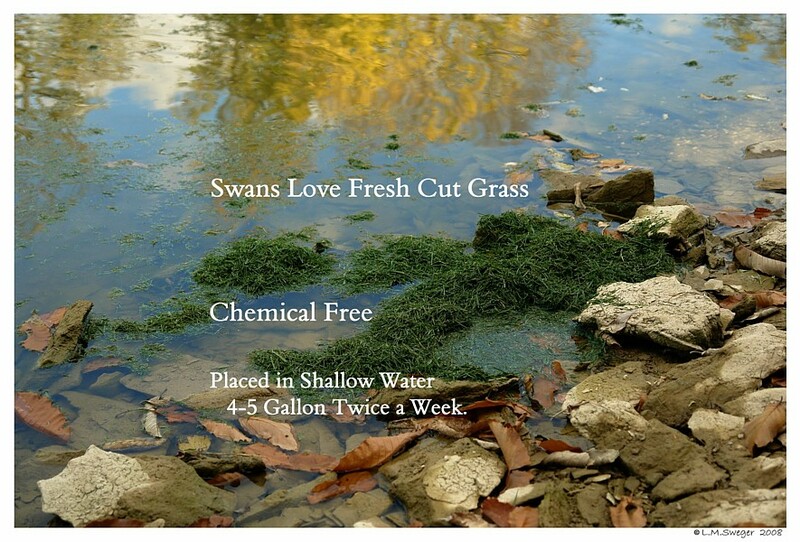 It is the most acutely lethal toxin known. 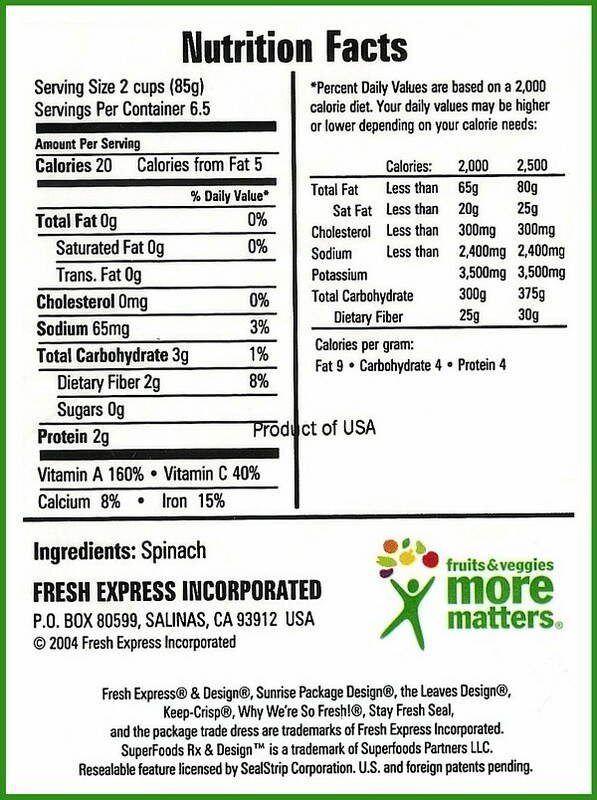 A Lethal Dose may occur from introduction by ingestion, intravenously, intramuscularly or when inhaled. 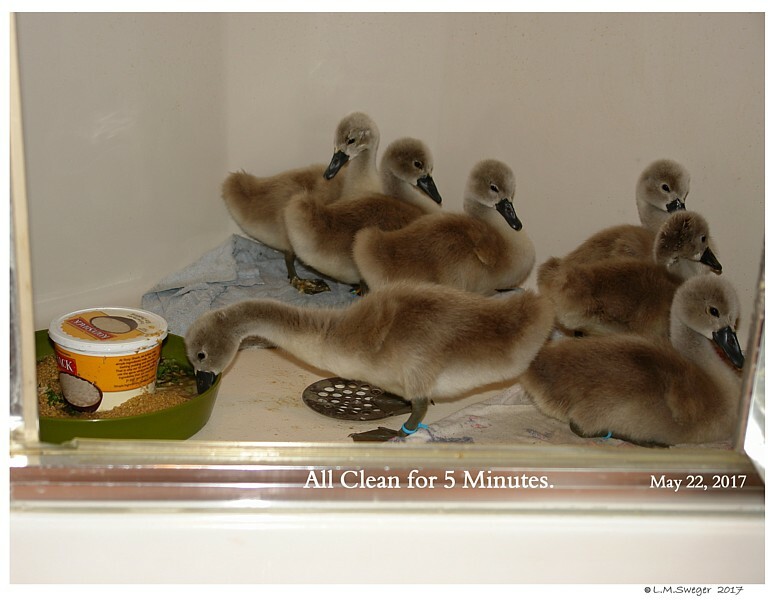 Botulinum toxin (BTX) can cause botulism, a serious and life-threatening illness in humans and animals. 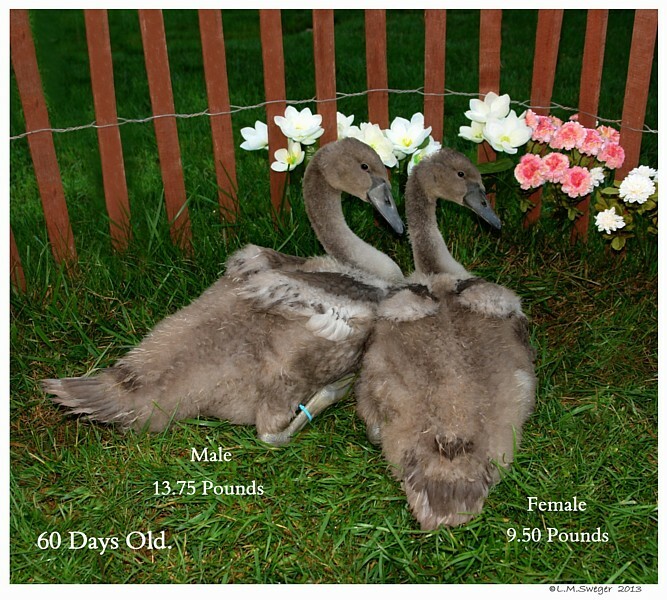 Avian Botulism (Type A) or Limber Neck is a toxemic disease found in Poultry and Waterfowl. 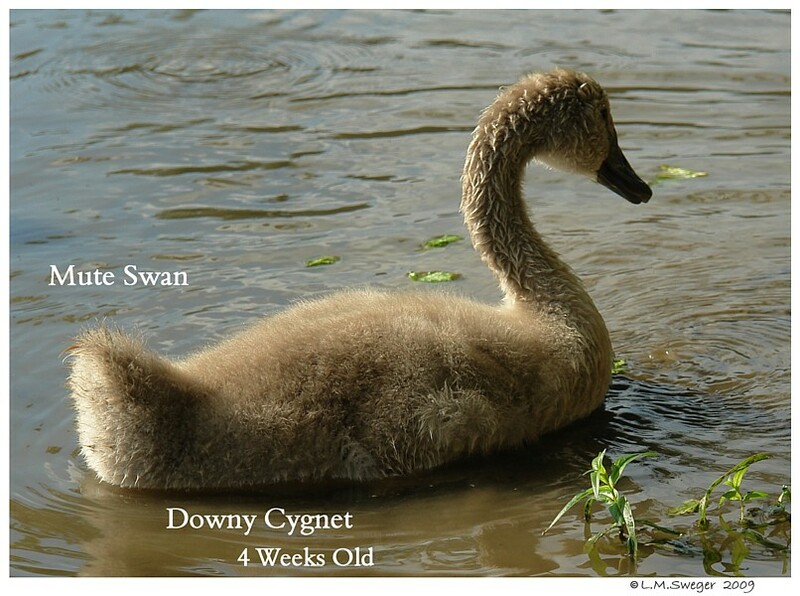 The early visual sign is a weak, hanging, floppy neck. 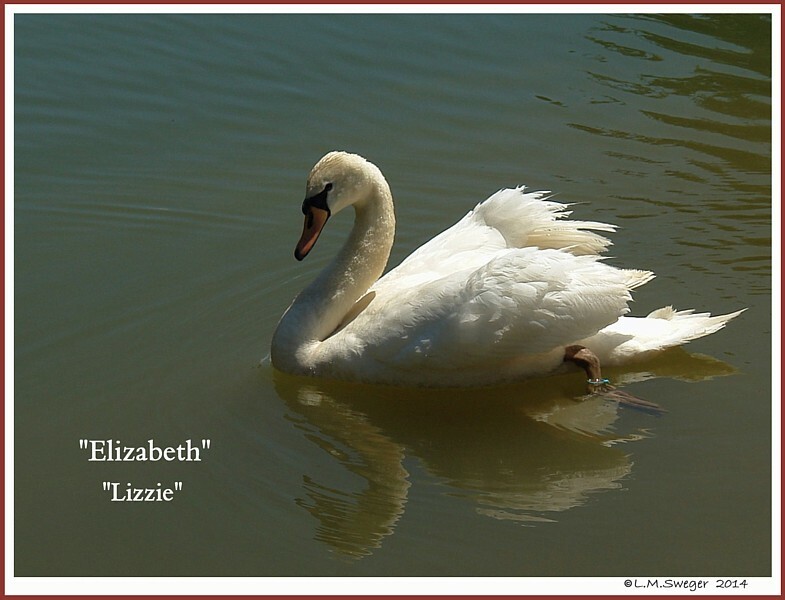 Hence, the common name “Limber Neck” disease. 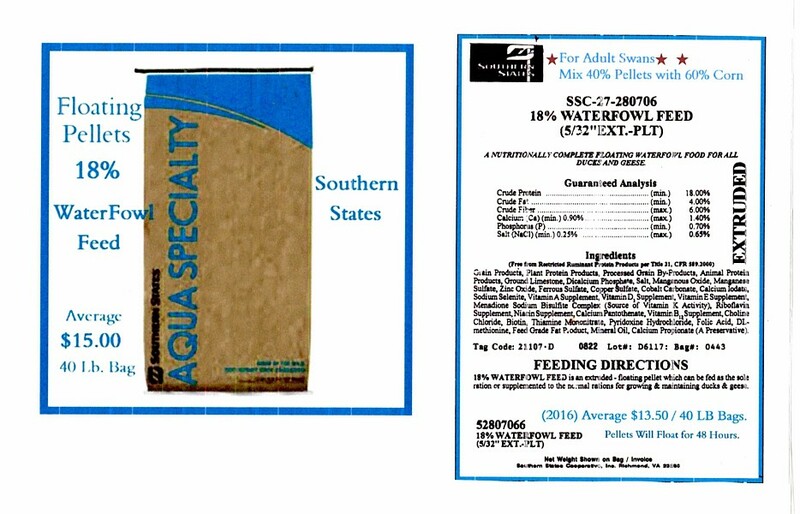 This has been noted when Birds are repeatedly fed contaminated Human food. 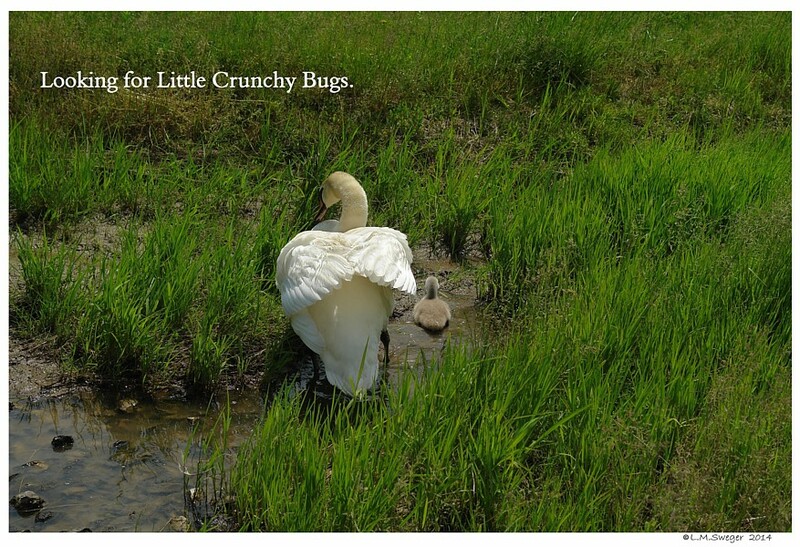 The affected Birds display weakness, poor coordination, prostration, poor appetite, shallow breathing, progressing to coma and death. 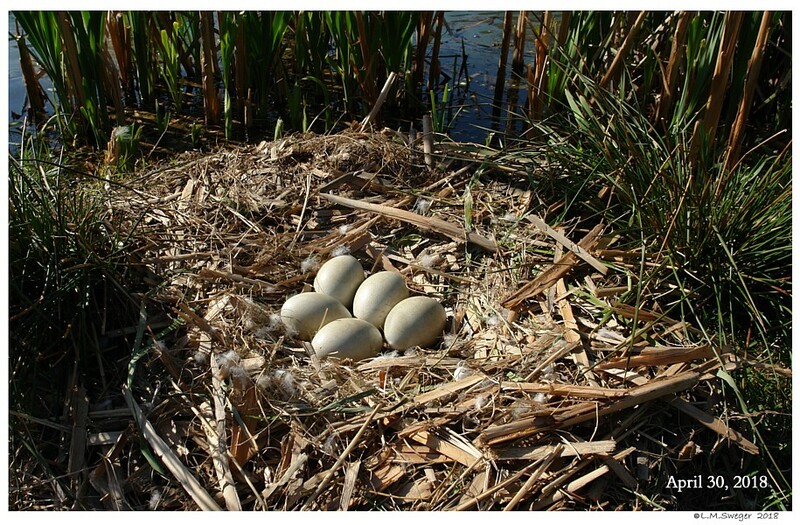 B. botulinus was isolated from the intestinal tract of the affected Birds. 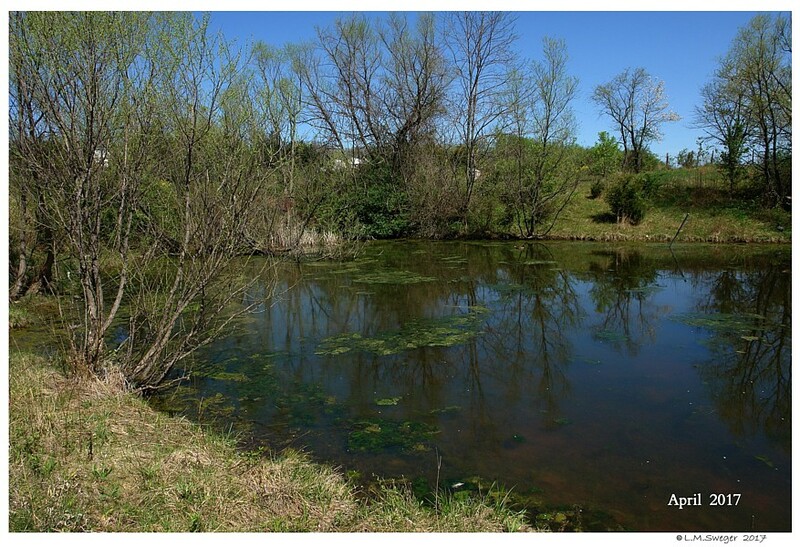 All cases of Botulism cannot be prevented because the various strains of the bacteria that cause this disease are in soil, dust, compost piles and easily form in stagnate standing water. 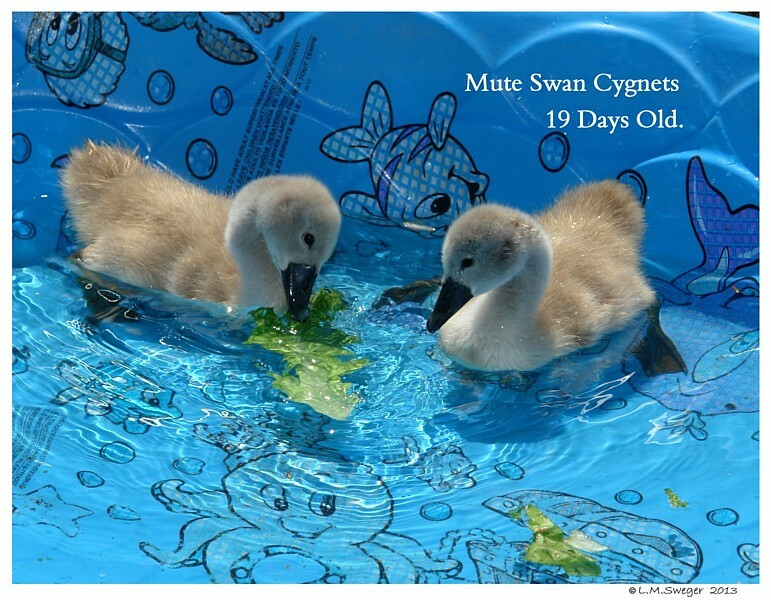 Stagnate water can be dangerous for drinking because it provides a better incubator than running water for many kinds of bacteria and parasites. 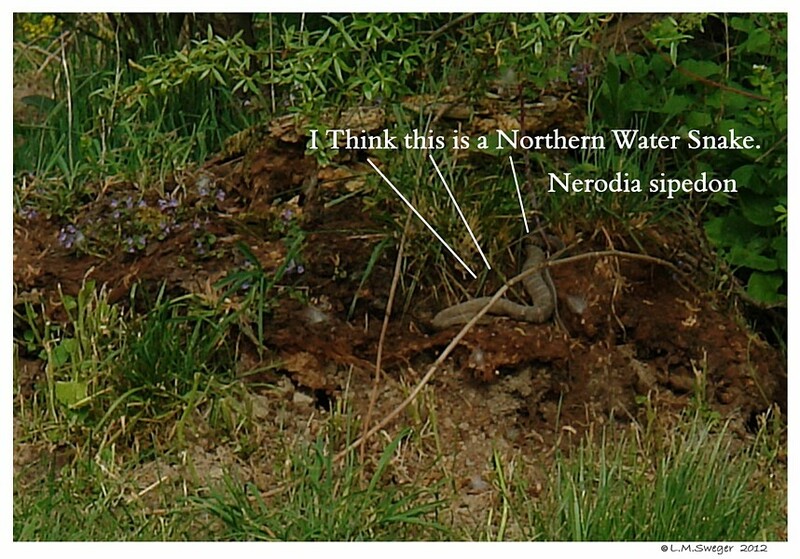 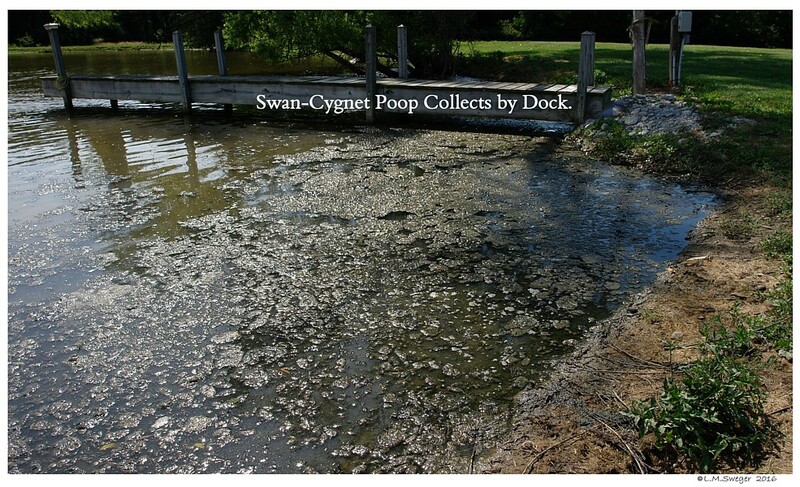 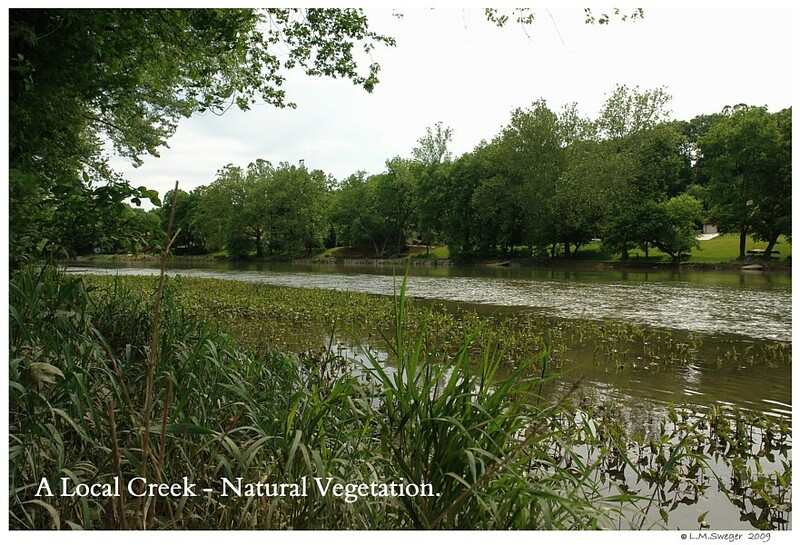 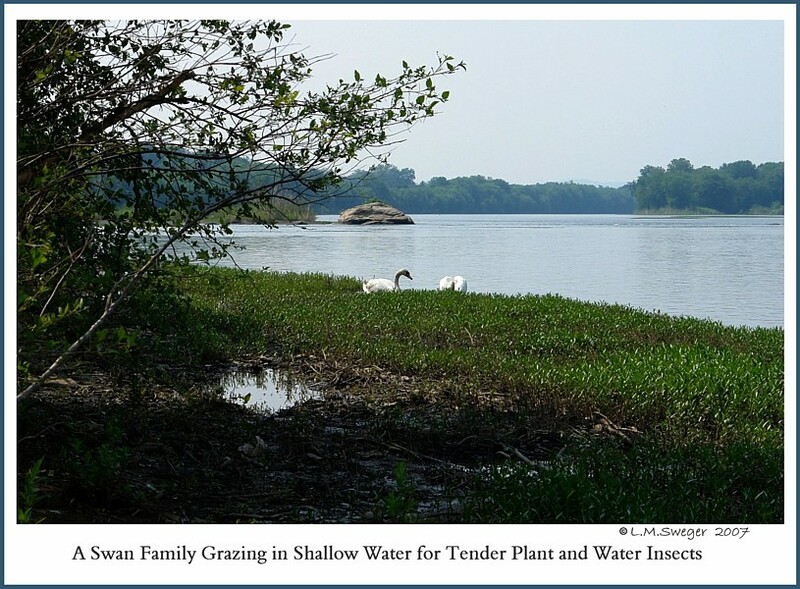 Stagnate water is often contaminated with human and animal feces. 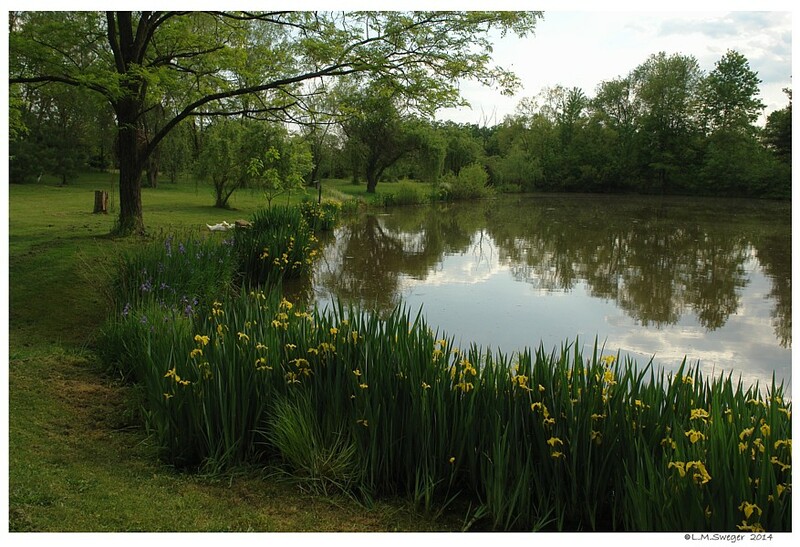 Having an working Aerator circulating the water in your Pond will reduce this risk. 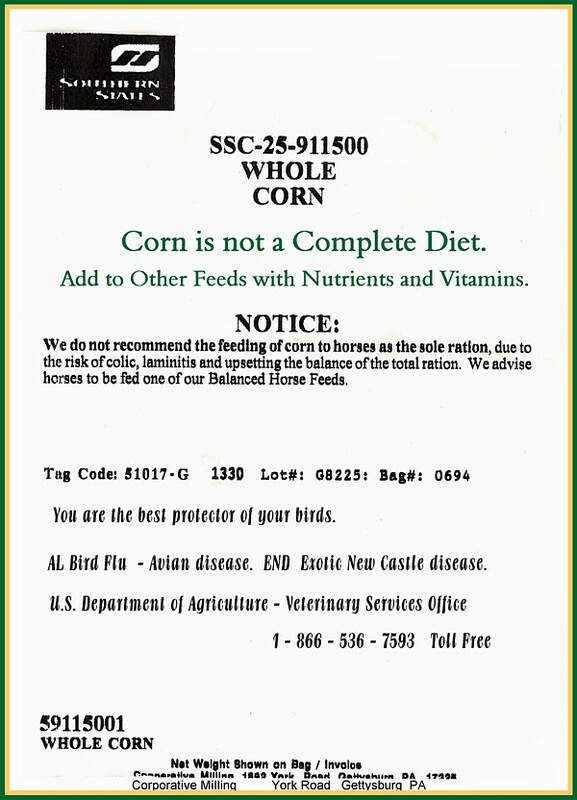 You will need to have it sent to your Veterinarian to be administered. 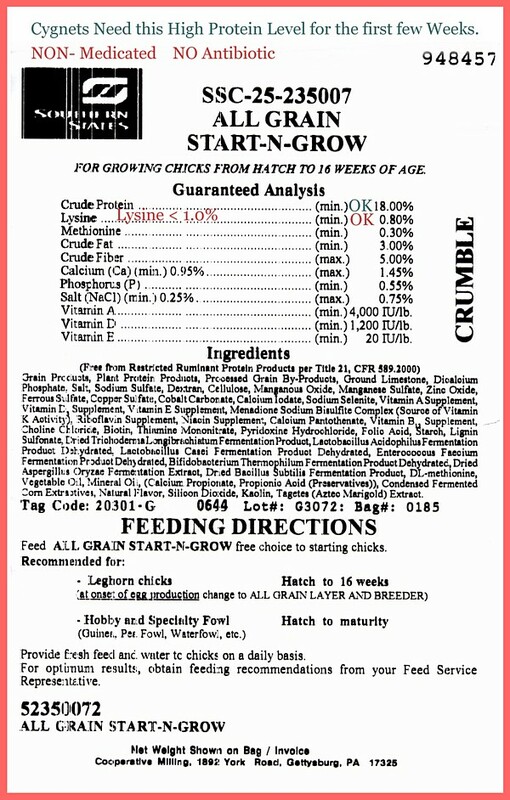 Or ask your Avian Veterinarian about this Vaccine. 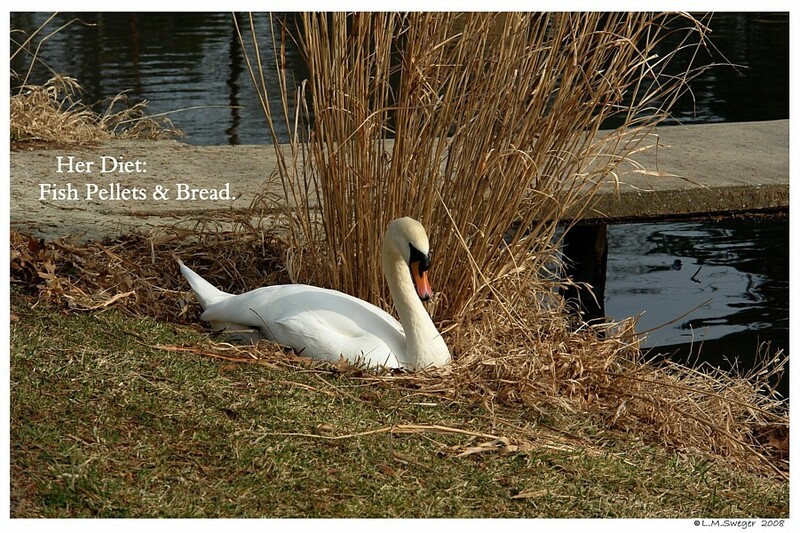 Another problem with Bread in general: Bread has Salt at levels too high for a Swans system. 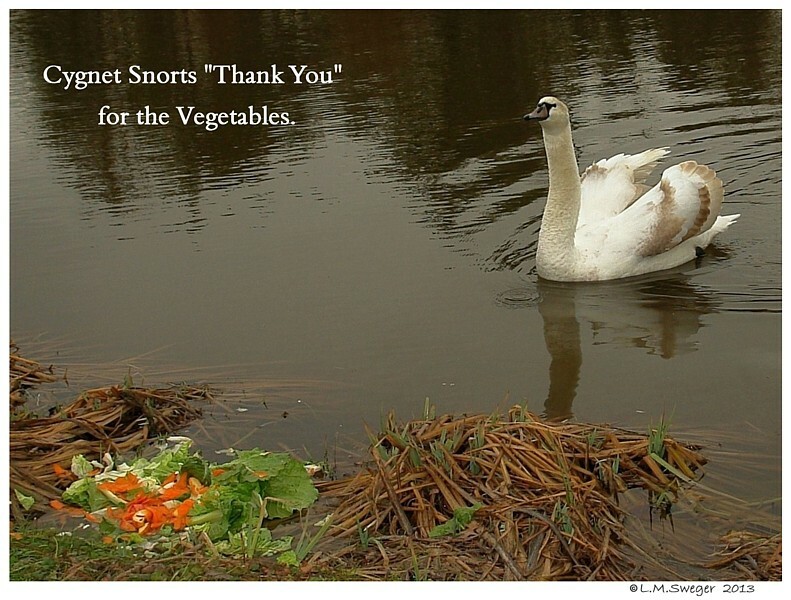 Salty Foods will tax and over work a Swan’s Kidneys. 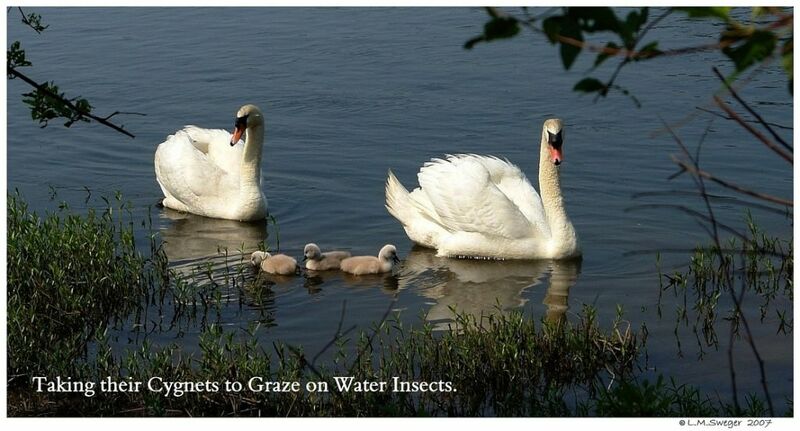 It may cause them excessive thirst and to retain fluids. 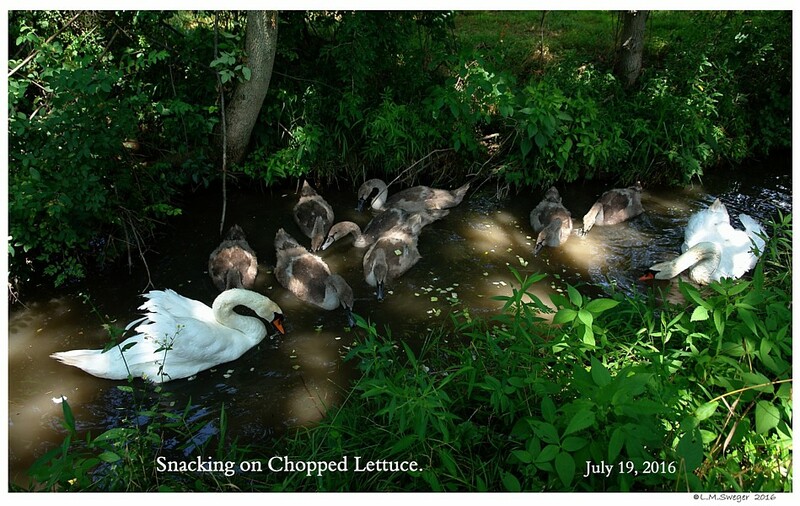 Over time this may lead to Cardiac Overload, Congestive Heart Failure… and Death. 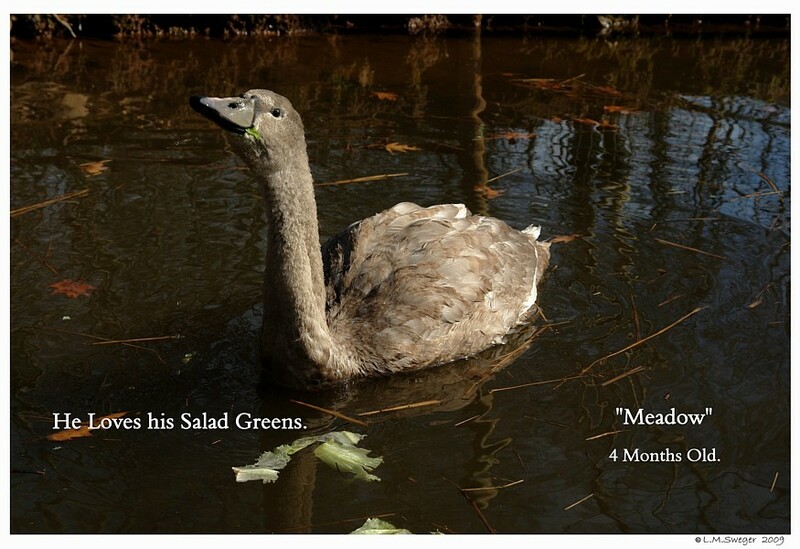 Not the Main Part of a Healthy Diet. 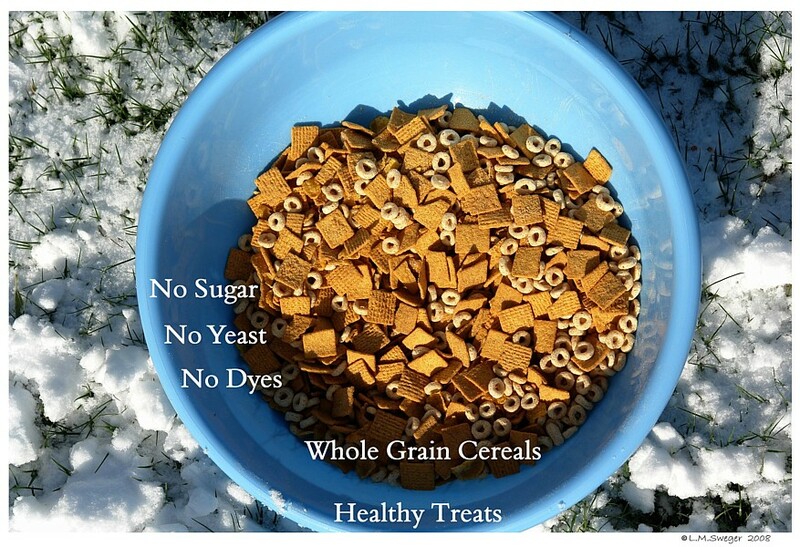 Plain Cheerios, Corn Flakes, Kix, Chex, etc. 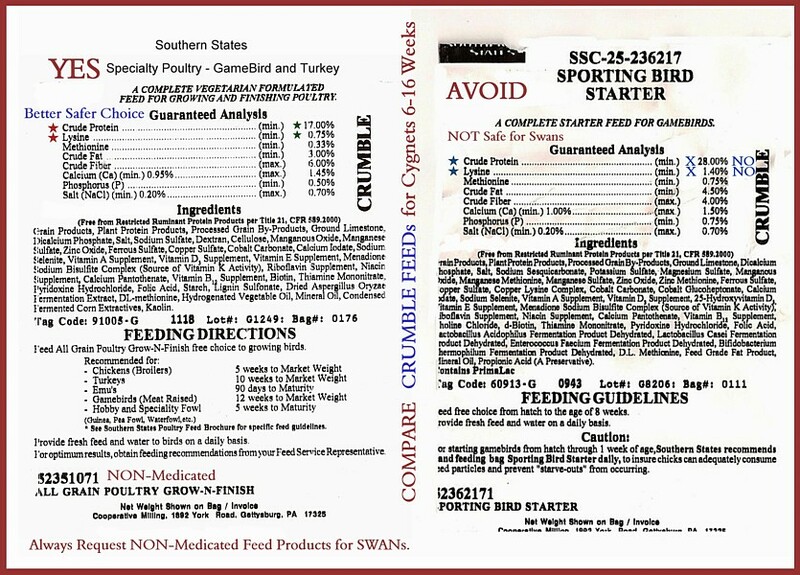 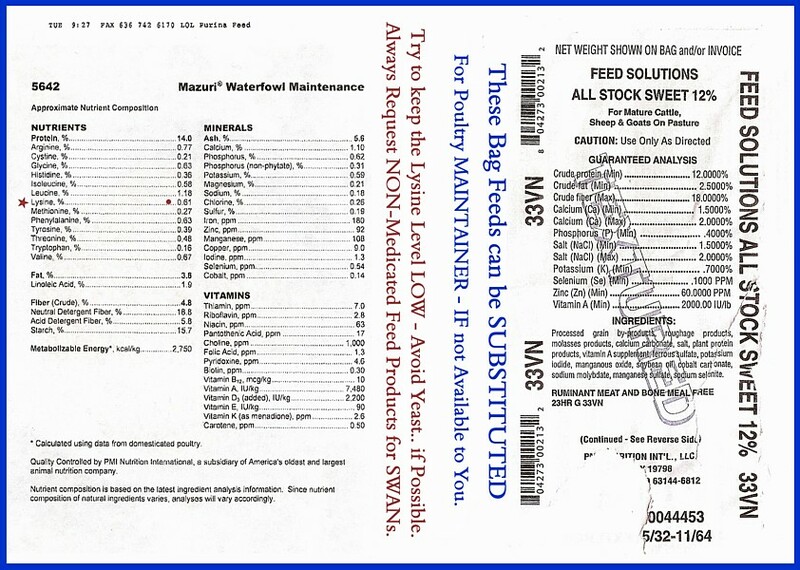 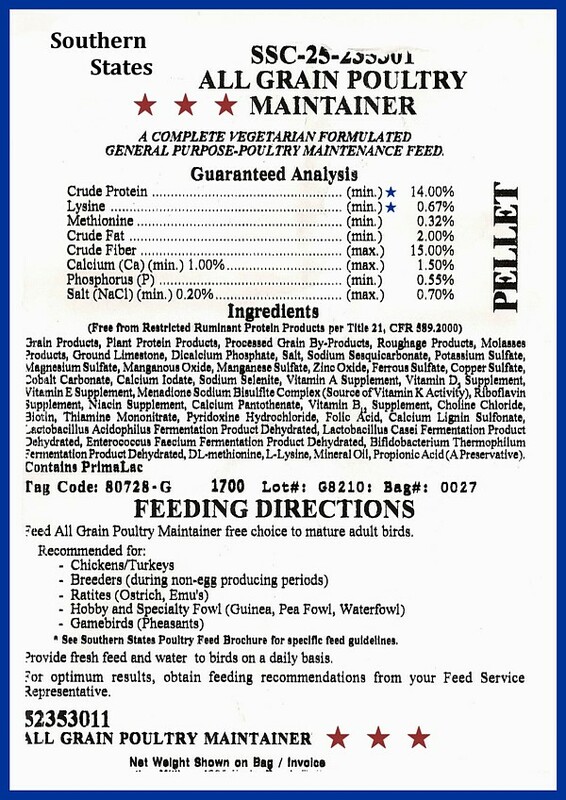 Read the Box – Product Ingredients. 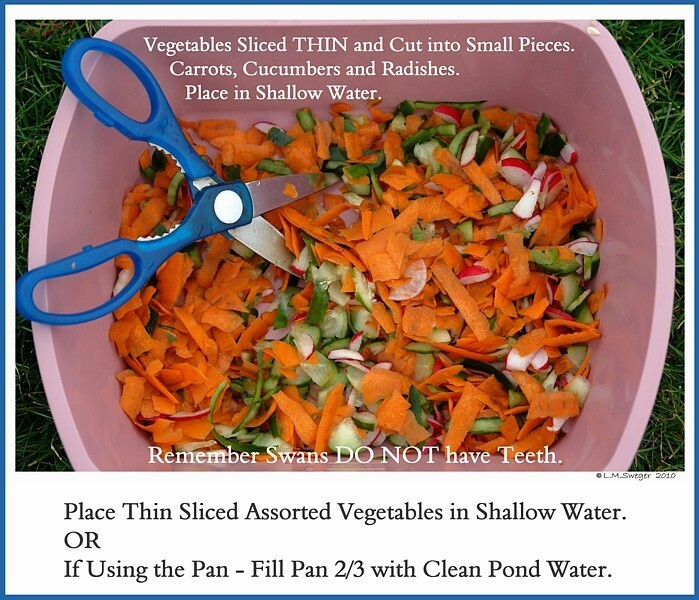 Apple Slices, Cucumber Slices, Carrot Peelings. 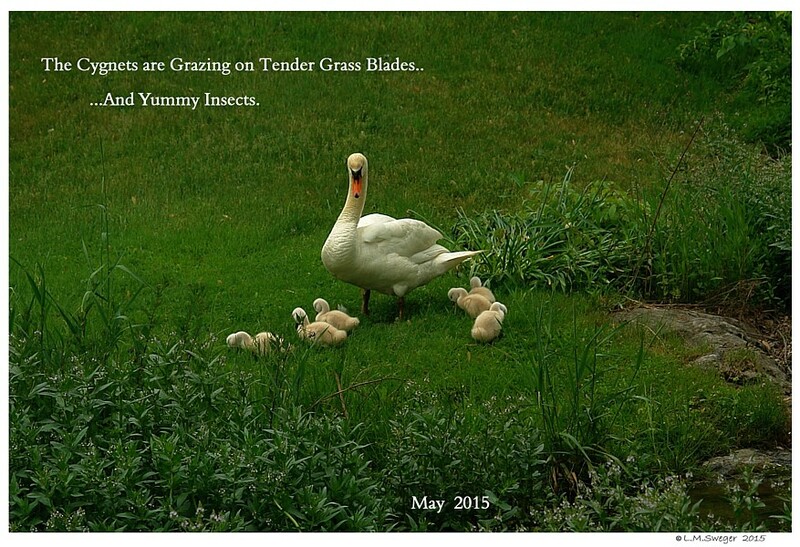 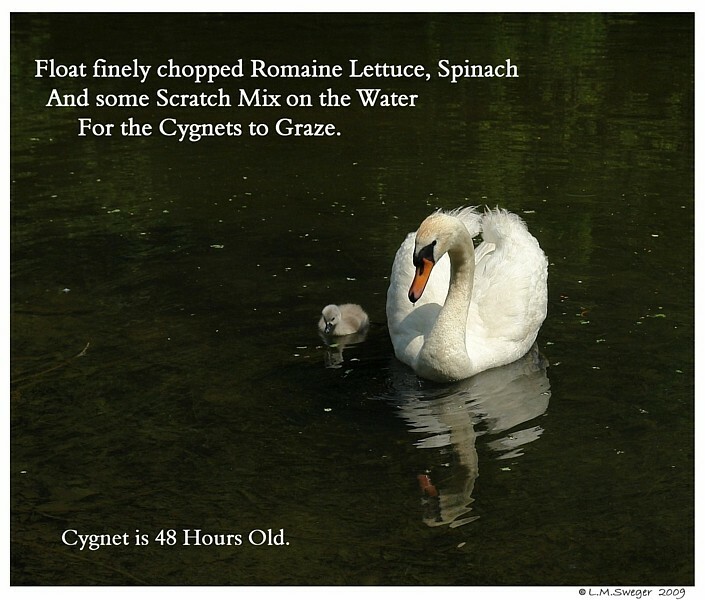 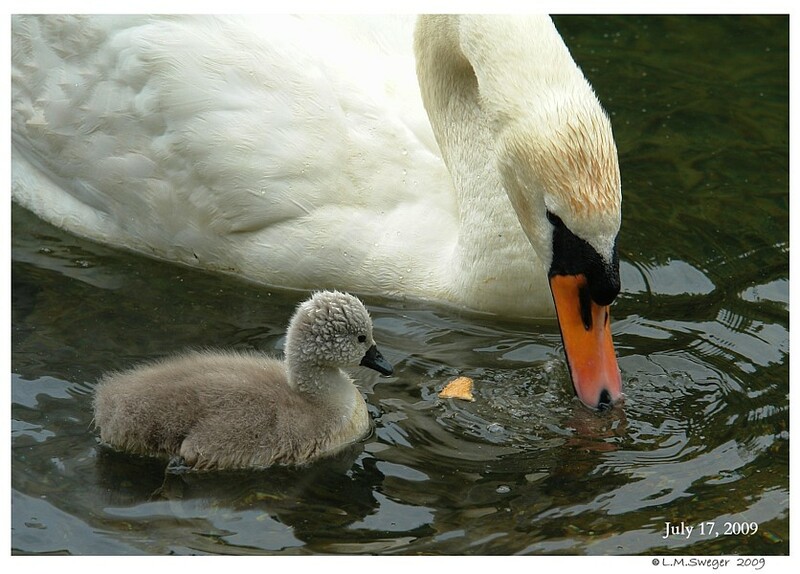 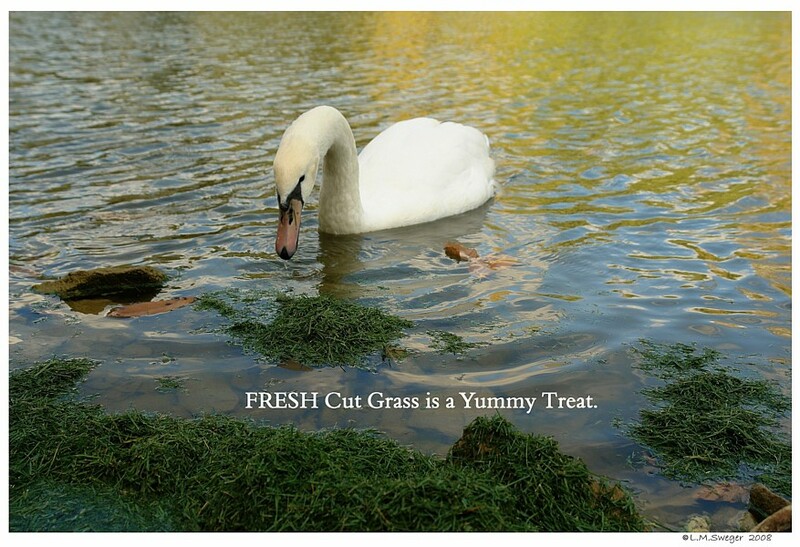 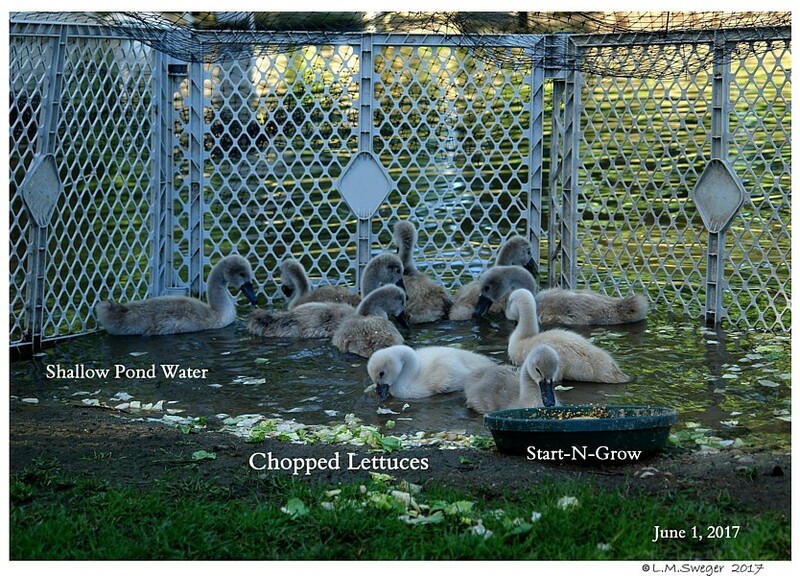 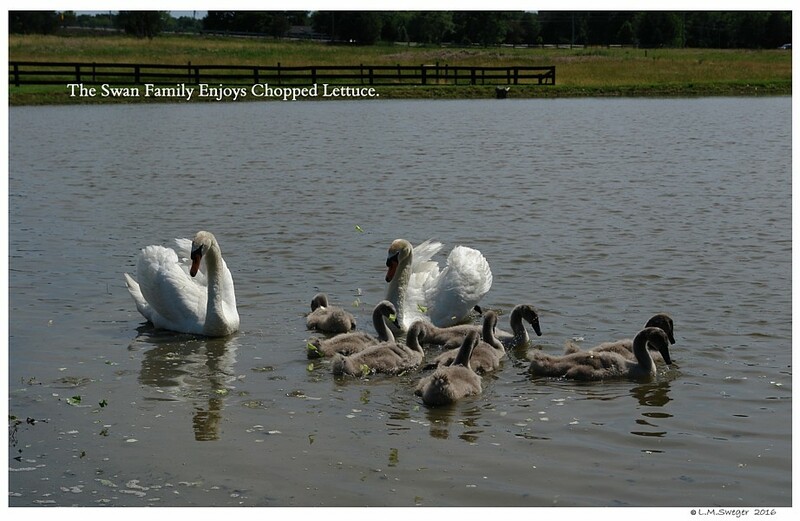 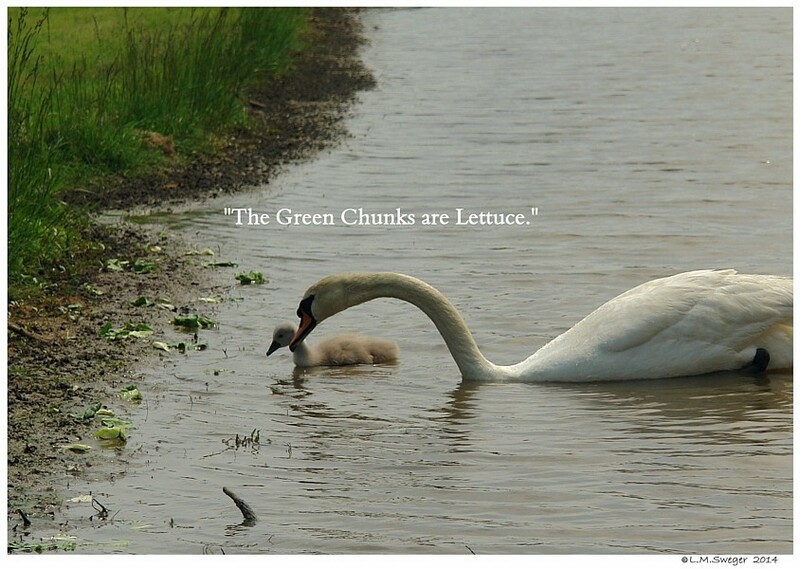 Swans LOVE most Vegetables… Healthy Treats. 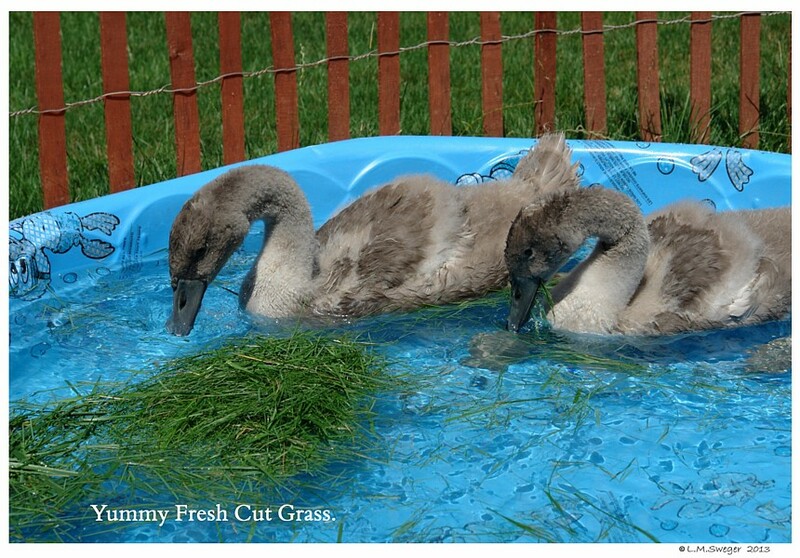 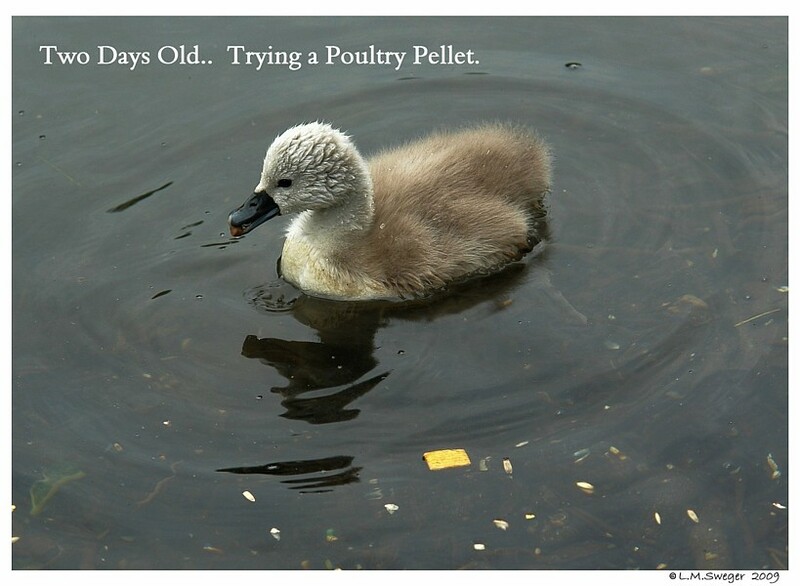 For Captive Swan OWNERs ONLY..
A “LITTLE” Fresh Course WHOLE GRAIN BREAD may be OK!! 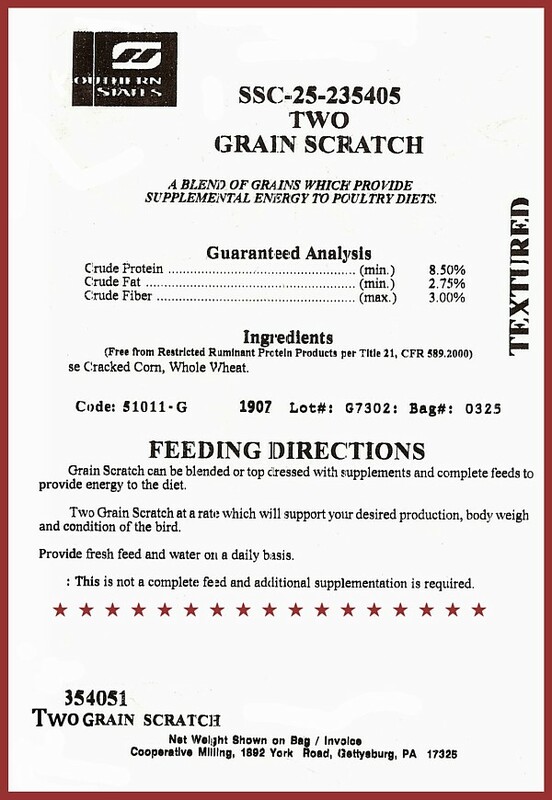 The Oil in Whole Grain Breads may be beneficial during Cold Weather. 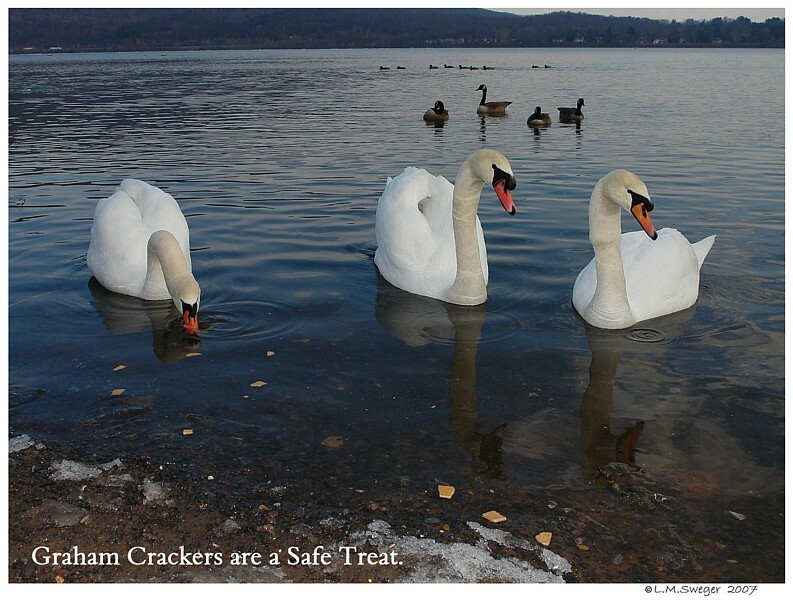 The extra Quick Energy Calories may help the Swans stay warm. 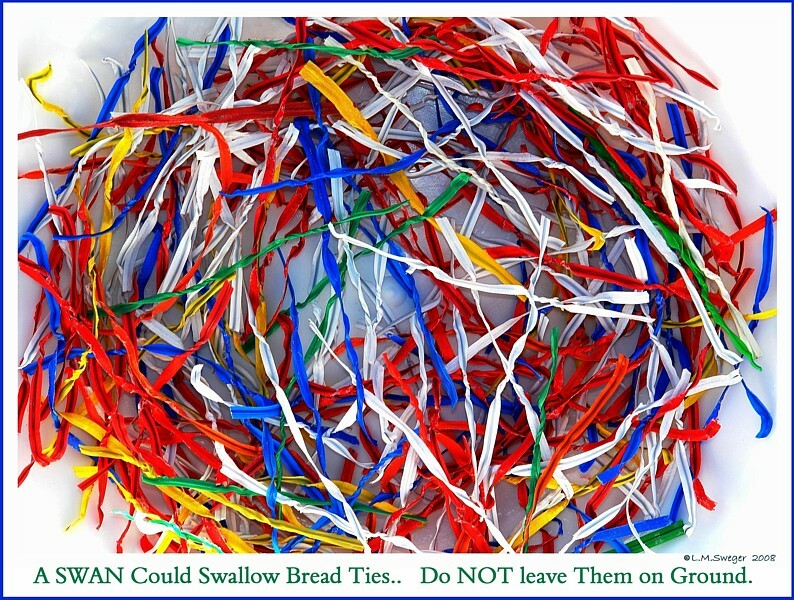 Freeze the Loaf of Bread to prevent any Mold. 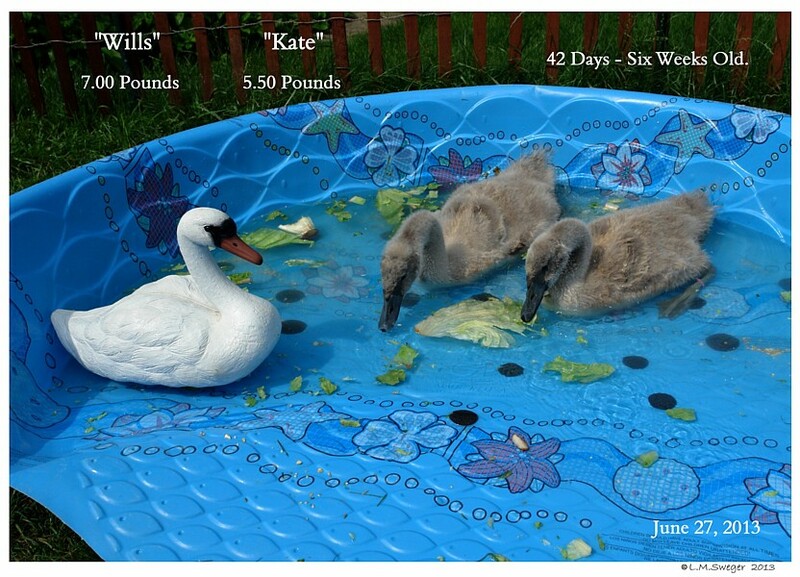 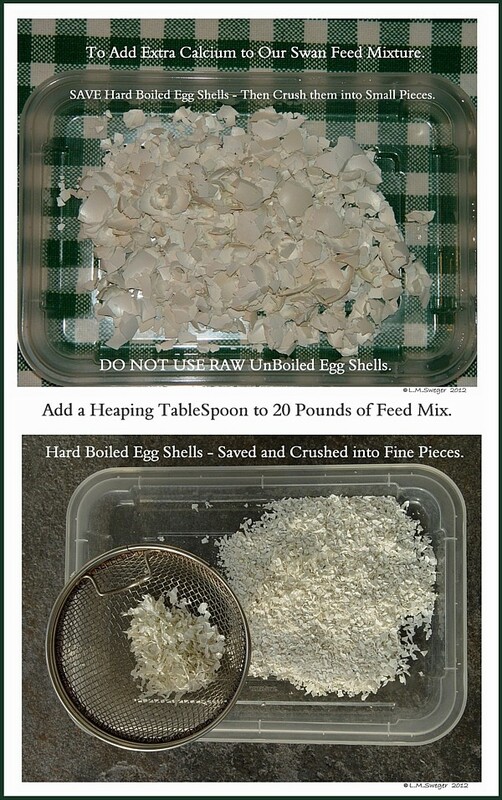 One Slice per Day per Swan. 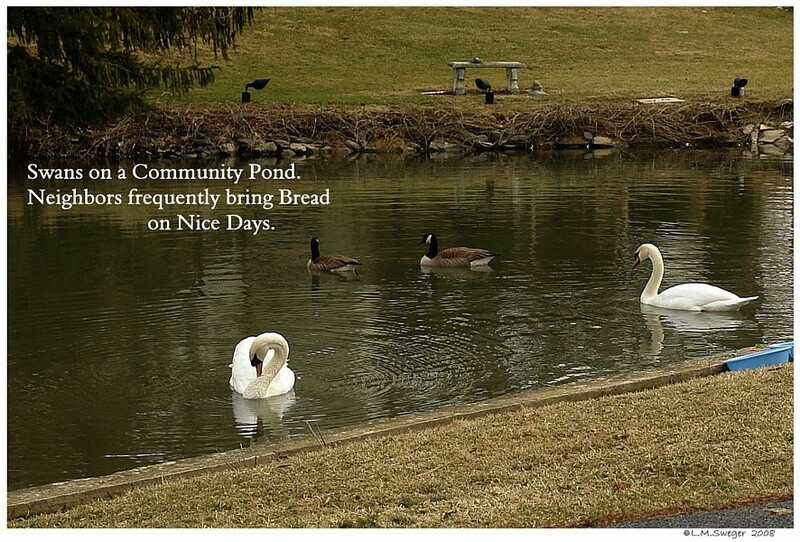 NO BREAD during Warm Weather Months. 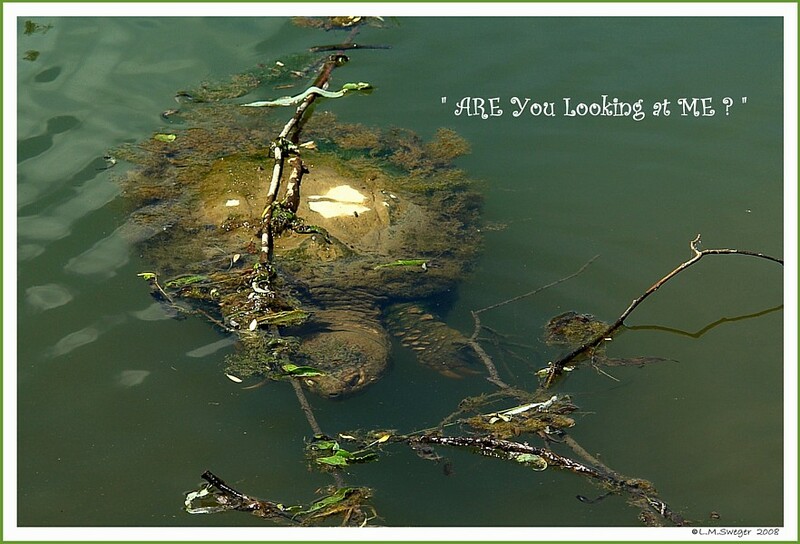 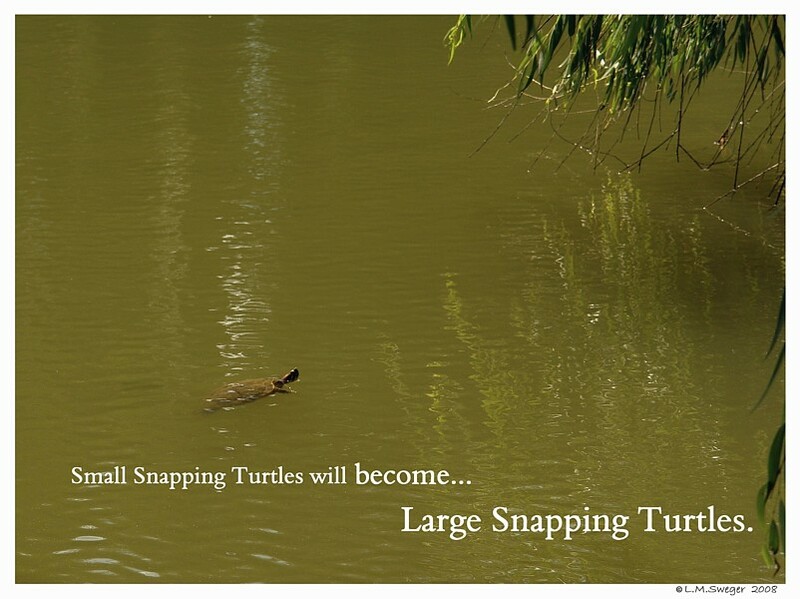 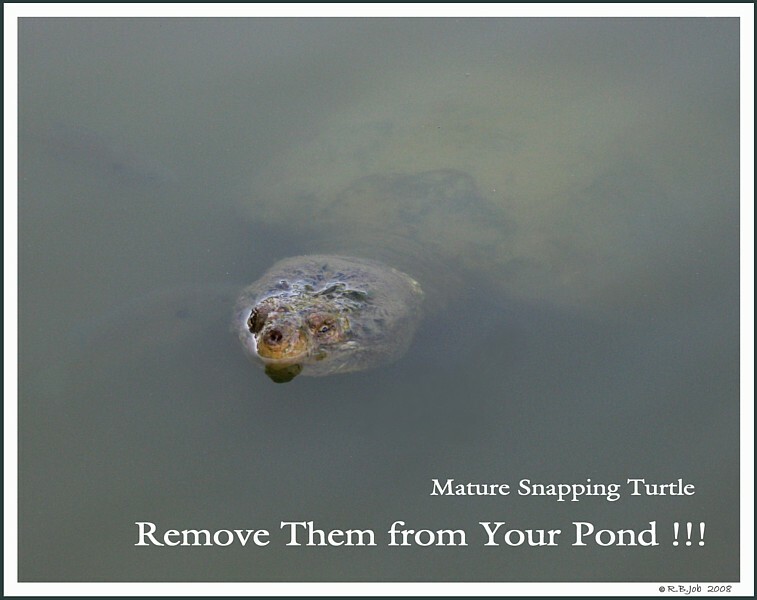 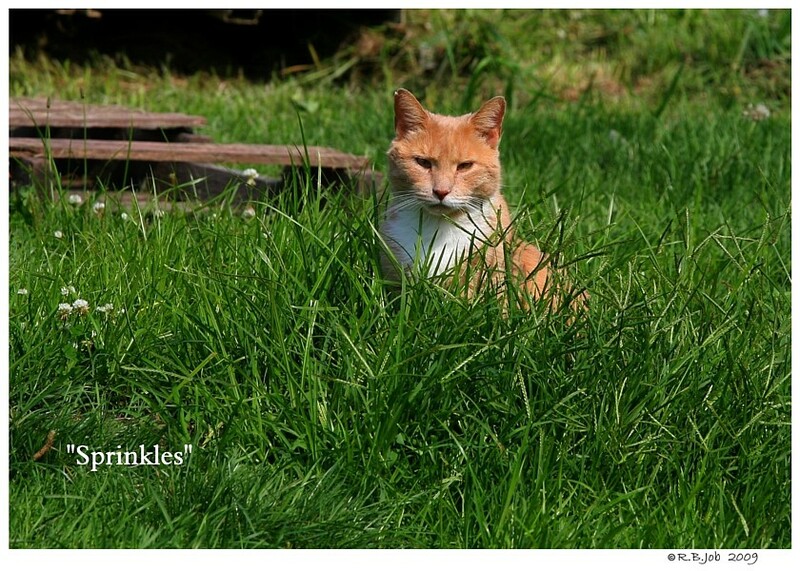 to Predators that move about near their Ponds or Lakes. 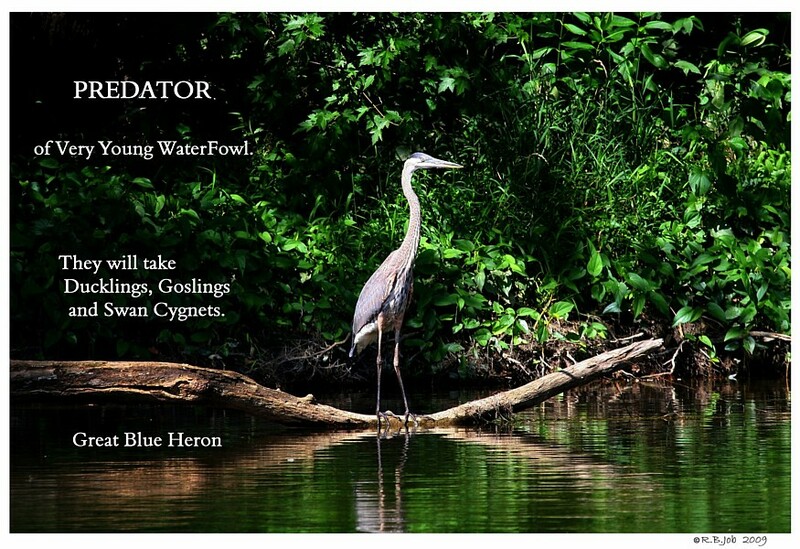 Sit up High and Watch for Fuzzy Prey. 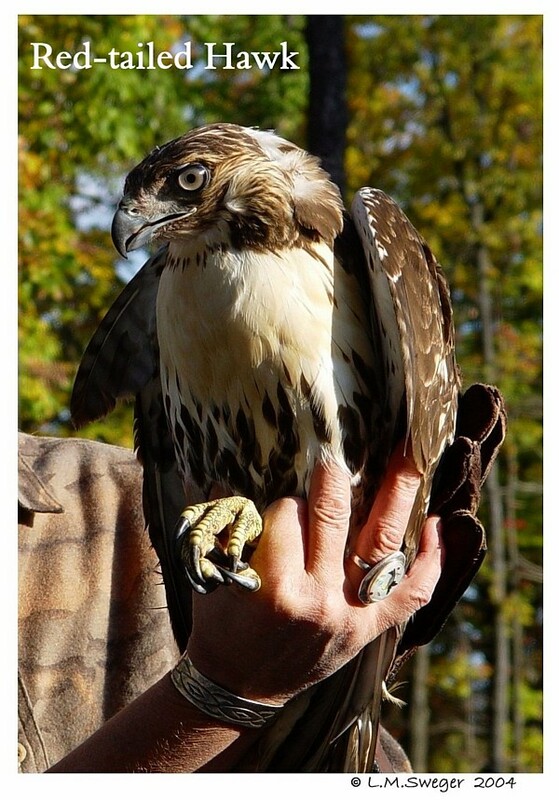 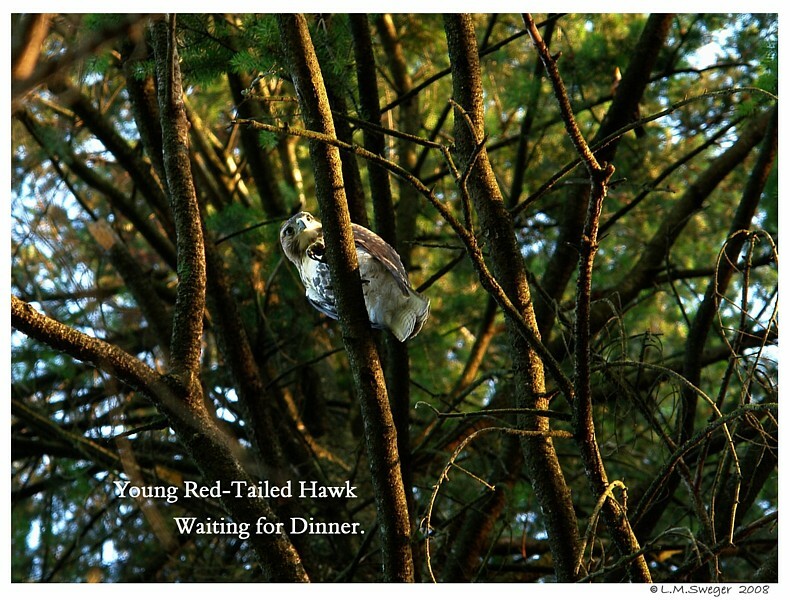 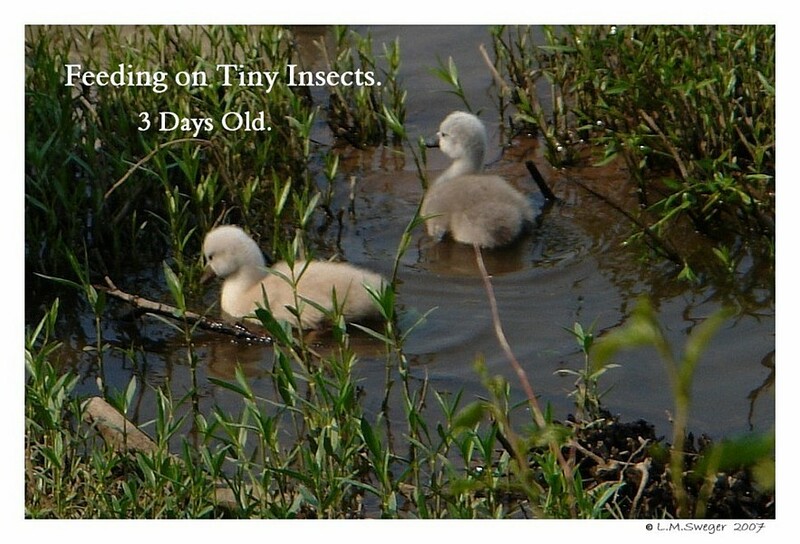 NIGHT Owls… are Silent Predators of Young Waterfowl. 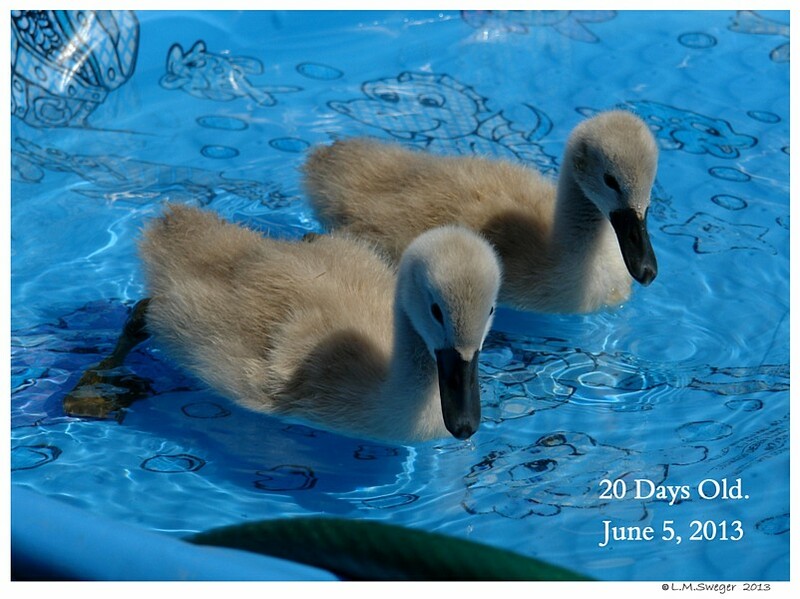 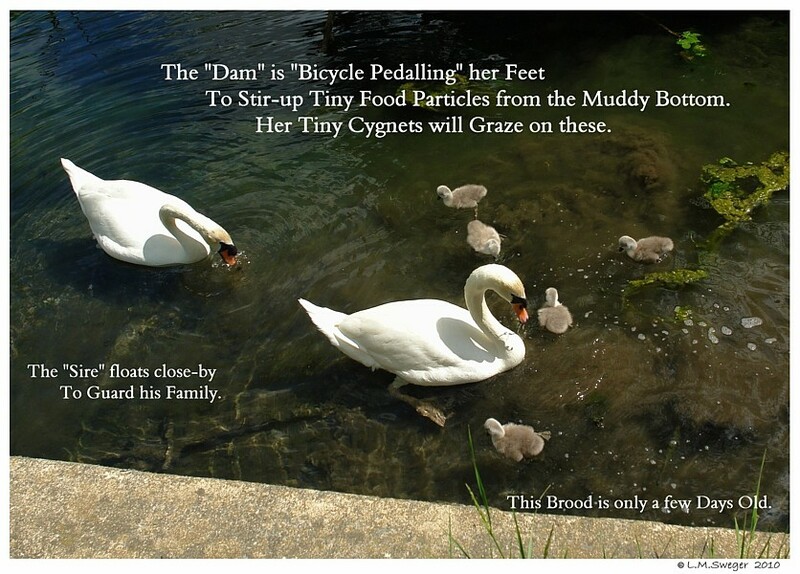 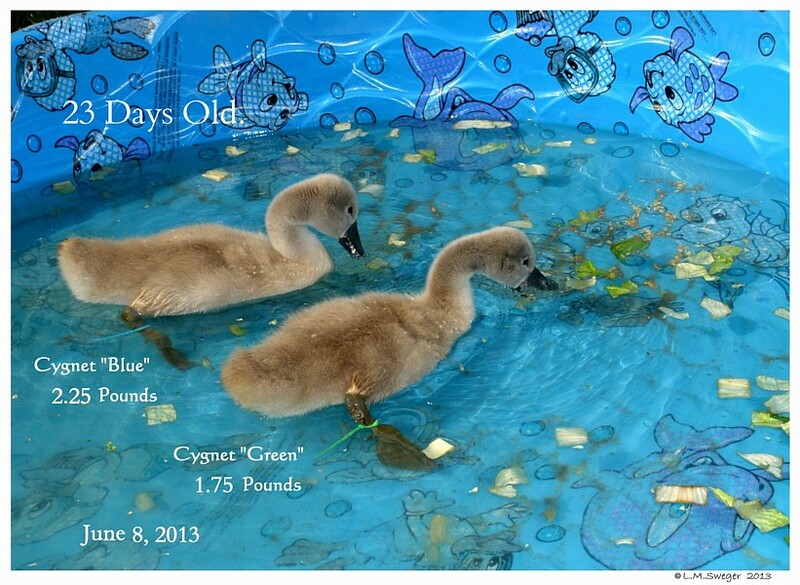 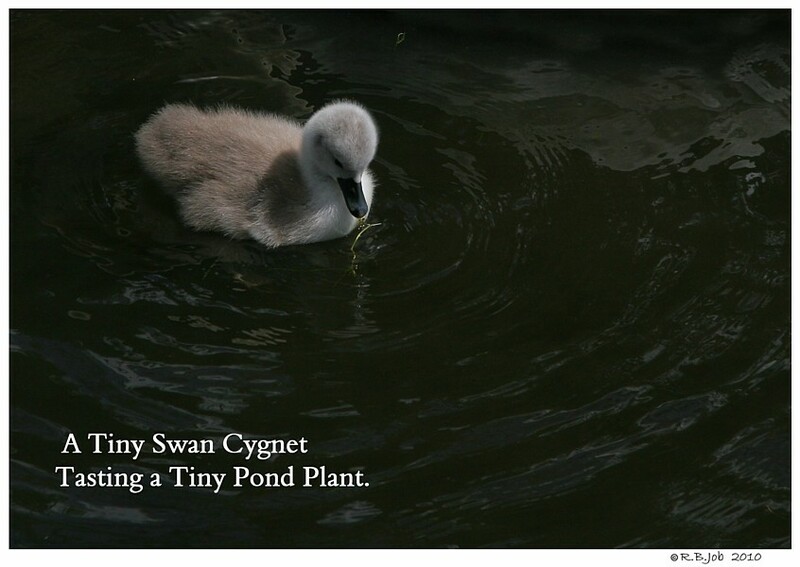 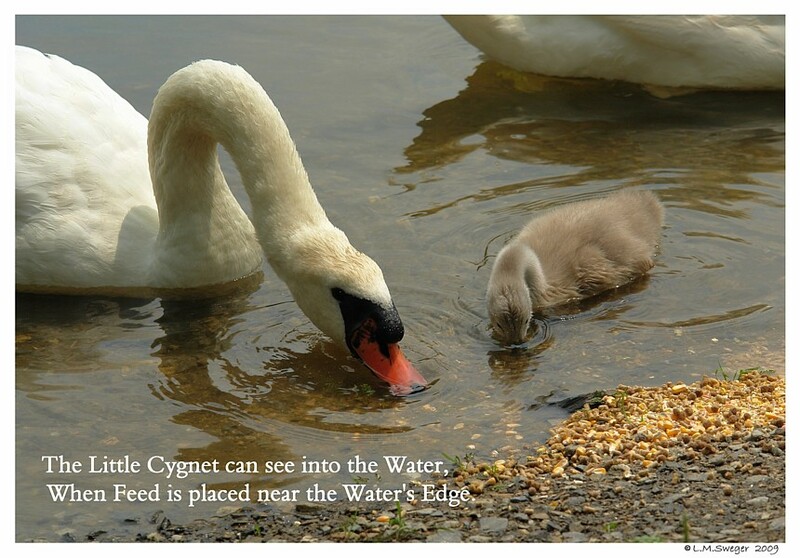 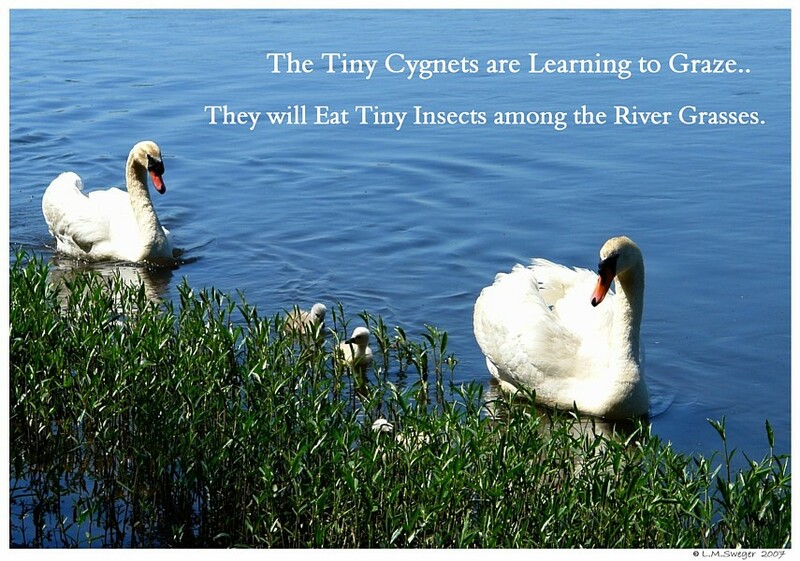 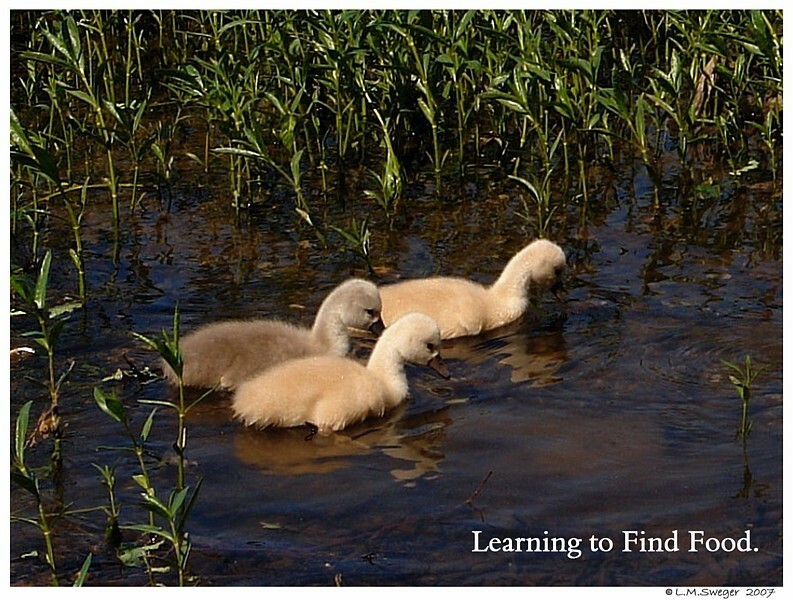 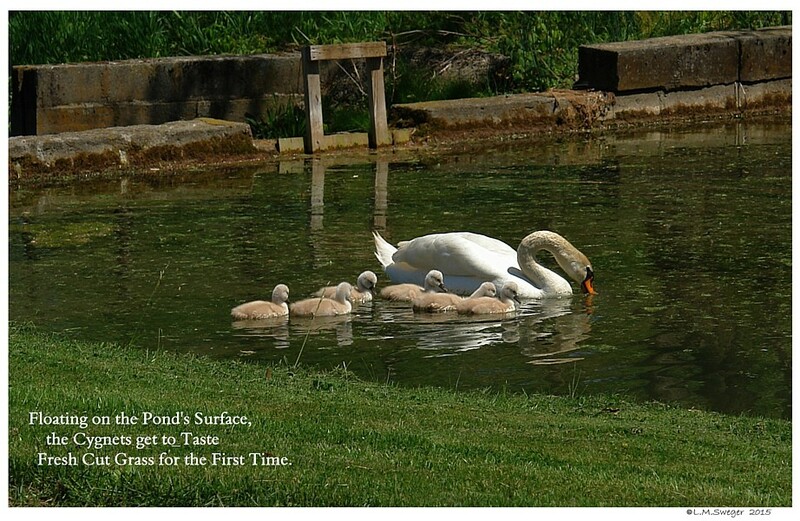 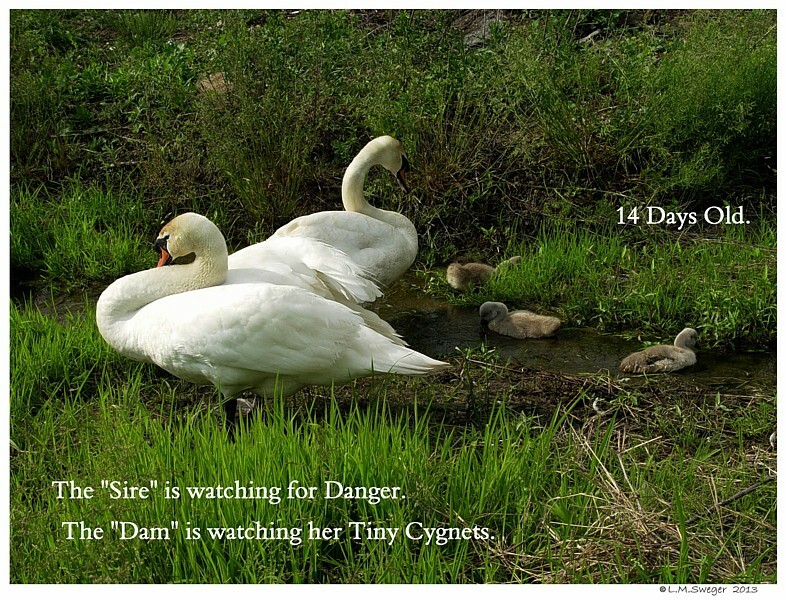 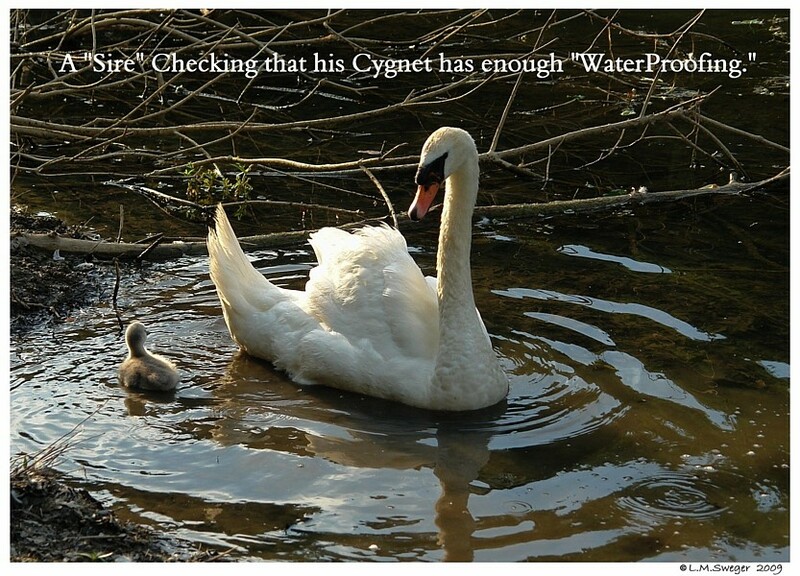 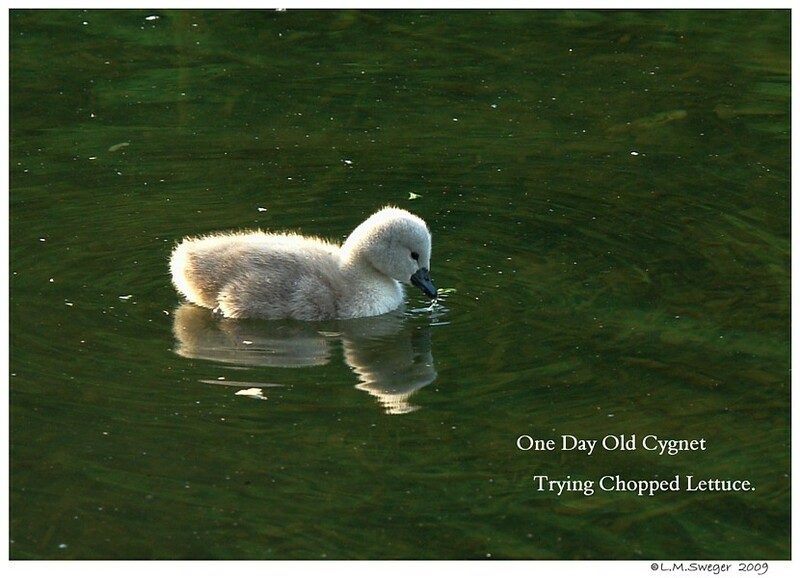 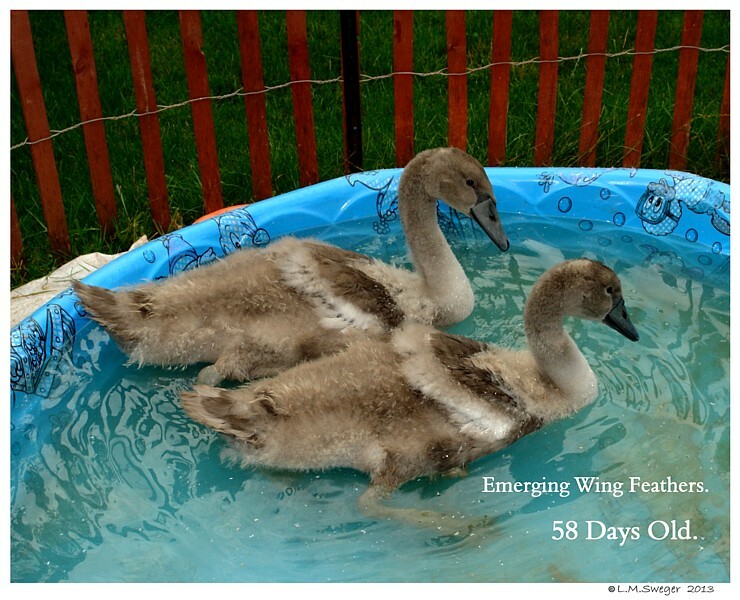 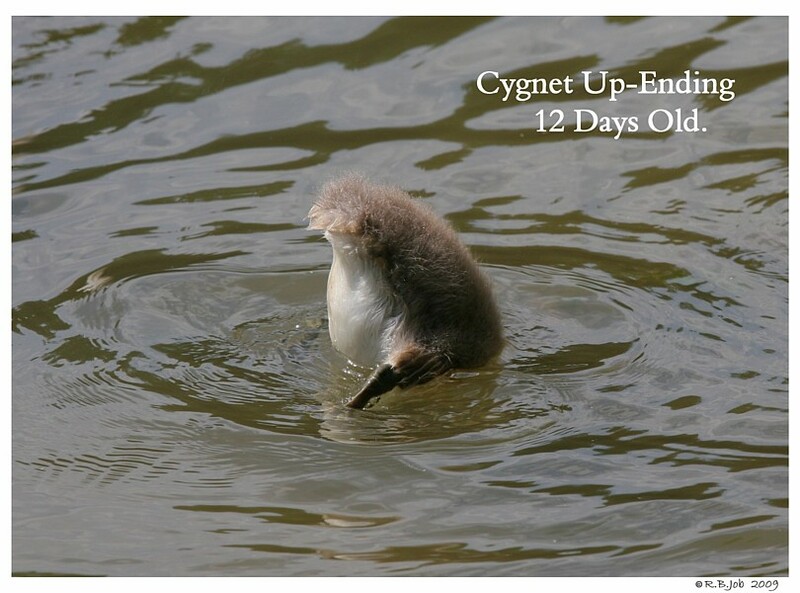 Tiny Cygnet act like Play Toys. 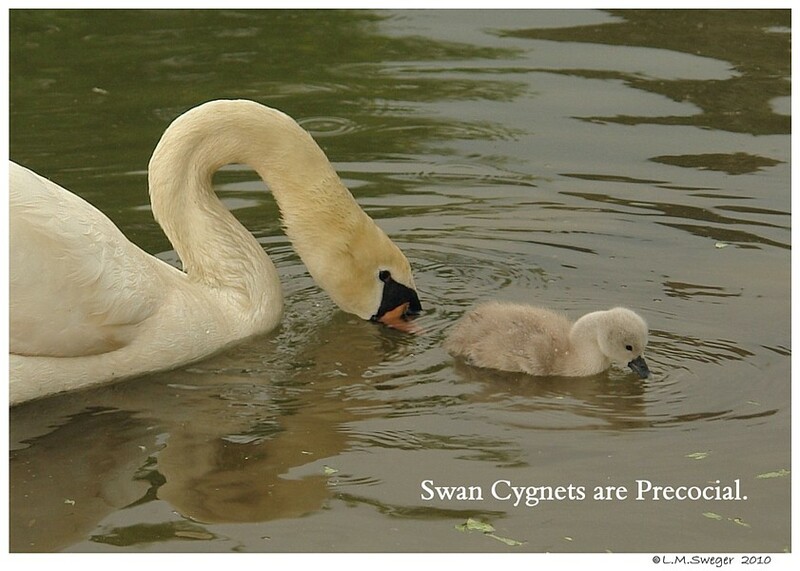 will Steal Swan Eggs and Kill Cygnets and Swans. 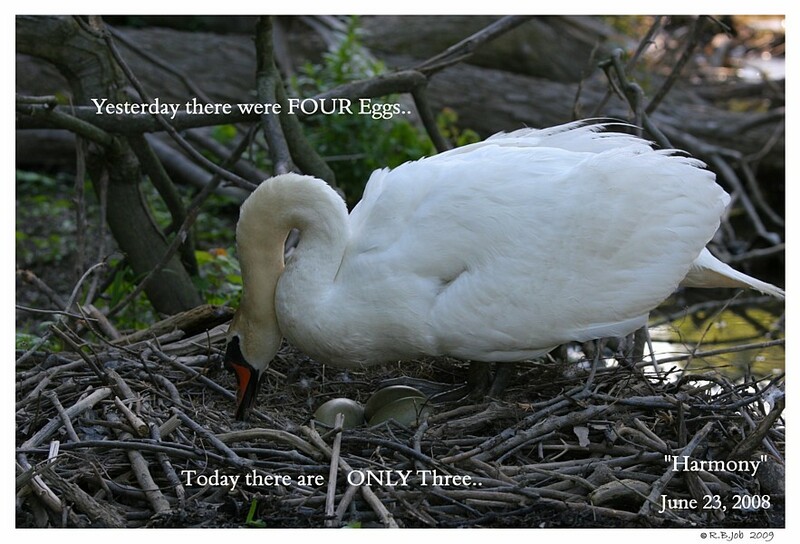 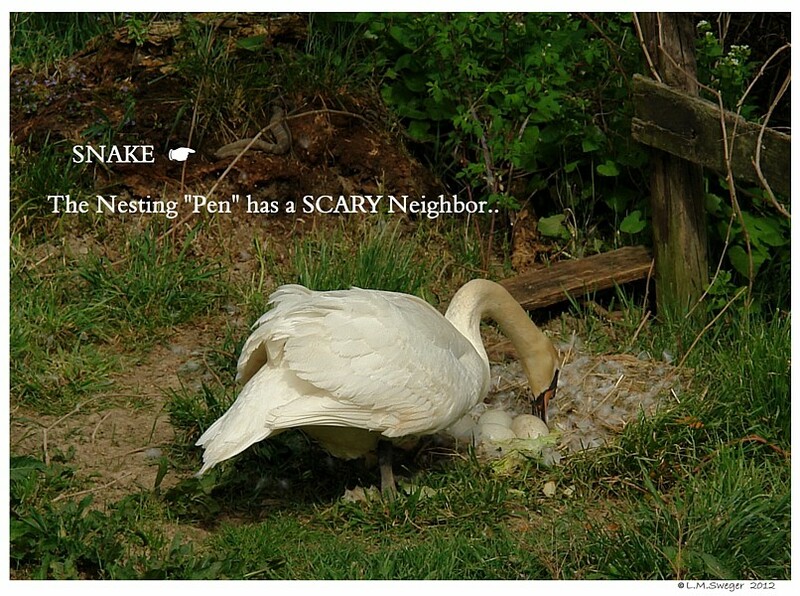 Over the Years we have Experienced MANY Swan Eggs being Stolen. 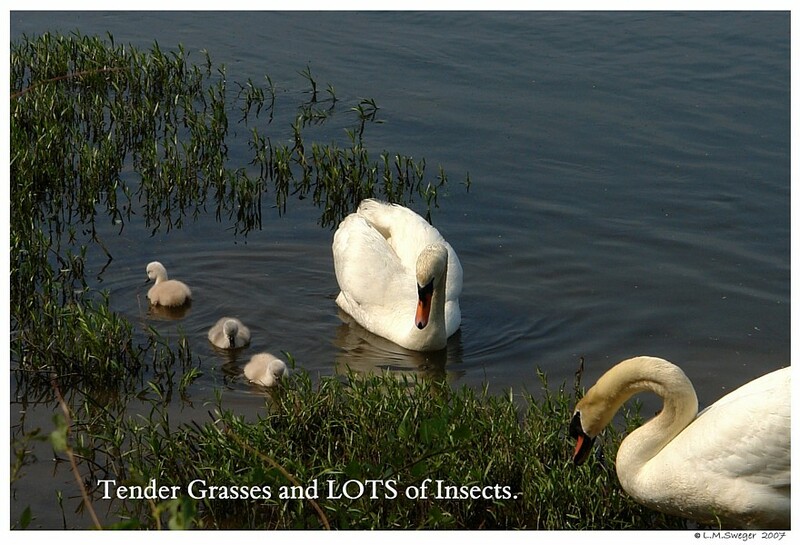 Assorted SNAKEs will take Small Waterfowl..